Uyghur Latin Yéziqi (yeni Uyghur Latin Yéziqi– ULY) kompyutér saheside we bashqa munasiwetlik sahelerde kona yéziqqa yandash qilip ishlitilidighan latin herpliridin tüzülgen yéziq bolup, 2001- yilning aldinqi yérimida Ibrahim Mutihi, Mirsultan Osman, Muhebbet Qasim, Imin Tursun, Abliz Yaqup, Xemit Zakir, Arslan Abdulla, Hoshur Islam, Türgün Ibrahim .. qatarliq alim, tilshunas, doktor we proféssorlarning qatnishishi bilen 5 qétimliq ilmiy muhakime yighini arqiliq 2000-yilighiche ishlitilgen 15 xildin artuq oxshash bolmighan lahiyini estaidil muzakire qilish arqiliq 2001-Yil 3-Iyul küni birlikke keltürülgen. Shuning bilen bir waqitta, birlikke keltürülgen lahiye Shinjang Uniwérsitéti teripidin aptonum rayunluq xelq hökümitige we til-yéziq komététige yollan’ghan. Aptonum rayunluq xelq hökümiti sabiq reis Ablet Abdurishitning teshkillishi bilen shu yili baharda “Uyghur isim – familisi we UKY toghrisida mexsus pikir anglash yighini” chaqirip, deslepki qedemde Uyghur isim – famililirini qéliplashturush, shundaqla UKY ning ammiwiy asasini puxtilash, undin kéyin sharait pishship yétilgende qayta muzakire qilish arqiliq qanunlashturuup resmiy yeziq sheklide qollunush qararigha kelgen. Ilmiy muhakime yighinlarda “Uyghur Latin Yéziqi (yeni Uyghur Kompeyoter Yéziqi depmu atilidu) ni ishlitish yéziq özgertish islahati qilish bolmastin belki kona yéziqqa qoshumche qilip ishlitilidu…” dep éniq körsitilgen hem tekitlen’gen. Eskertish: 1. Eger “öö, üü, éé” larni kirgüzüshke imkan bolmighanda, ULY belgilimisige asasen mas halda “Oo, Uu, Ee” larni ishlitishke bolidu. Ularni kigüzüsh usuli http://www.ukij.org/teshwiq/uey eou.HTM da körsitildi. Diqqet: 2005-yilining bashlirida tordashlarning teklipi we qollishi bilen Uyghur Kompyutér Yéziqi (UKY) dégen atalghuni Uyghur Latin Yéziqi (ULY) dep élip qarar qilin’ghan. Bundaq qilishtiki meqset UKY ning kompyutér tili/yéziqi bolghan 0 we 1 ler bilen ariliship kétip kishilerde atalgha yaki uqum qalaymiqanchiliqi peyde qilishtin saqlinish üchündur. UKY we ULY lar bir nersini körsitidu. Ular Uyghurche sözler arisida qisqartilma atalghu sheklide ishlitilgende mas halda”Uyghur Kompyutér Yéziqi” we “Uyghur Latin Yéziqi” dep oqilidu (yeni qisqartilghan söz ShUAR ni “Shinjang Uyghur Aptonom Rayoni” dep oqighandek). *3. Shinjang Téléwiziye Istansisi 2-Qanalda(XJTV-2) de 2001-yilining béshida tarqitilghan UKY gha ait mexsus xewer we Shinjang Géziti, Shinjang Iqtisad Géziti qatarliq metbuatlardiki xewerlerni arxip süpitide teminlishingizni qarshi alimiz. Tursun Ershidin (Sh.U.A.R xelq qurultiyi): ULY ni birlikke keltürüshke tenqidiy pikirlerni bérip, chüshenchilerni aydinglashturushqa yardem qilghanliqigha rehmet. Mirsultan Osman (Tilshunasliq alimi): 2001-Yil 20-Iyul qismen herplerni békitishte we ULY imlasi toghrisida mexsus ziyaritimizni qobul qilip qimmetlik pikirlerni berginige alahide rehmet. Hoshur Islam, Waris A. Janbaz (Shinjang Uniw. ): Her qétimliq ULY ilmiy muhakime yighinigha deslepki lahiye teklipi tüzüp teshkillesh we teshwiqat xizmiti ishliginige rehmet. Abduréhim, M.Erdem: ULY ni birlikke keltürüsh we uni tor béketliride ishlitish arqiliq toghra teshwiq qilish yolida 4 yildin buyan tewrenmey izdinip tordashlarning soallirigha estaidil jawab bérip körsetken ejrige köp rehmet. Kompyutér Mutixesisliri Hushur Islam, Türgün Ibrahim, Mirshat Létip, Alim Ehed, Yasin Imin, Waris Abdukérim Janbaz, Perhat Muhemmed, Mijit Ablimit, Erkin Imir qatarliq Proféssor, Dotsint we tetqiqatchilarning qimmetlik pikirlirige rehmet. Shinjang Uniw. Rehberliri Tashpolat Tiyip (Doktur), Arsilan Abdulla(Dotsint), Türgün Ibrahim(Dotsint) yighinni qollighanliqigha we teshkillesh jehette qimmetlik pikirlerni bergenlikige rehmet. Shinjang Uniw. Oqutquchiliri Mijit Xudaberdi (Proféssor), Yasin Ghupur, Memtimin Ghéni(Doktur), Razaq Metniyaz (Proféssor), Abdukerim Raxman(Proféssor), Qeyser Qadir, Ayqiz Qadir, Raxmanjanlarning qimmetlik pikirlirige rehmet. Shinjang Uniw. Kutupxanisi; Shinjang Uniw. 863 Tetqiqat Goruppisi Abdurusul Kichikaxun, Hoshur Islam, Yasinjan Memet, Mutellip Mamut larning matéryal, yighin orni teminligenlikige we qimmetlik pikirlerni bergenlikige rehmet. Jem’iyet erbabliri Nijat, Nejmidin(Qarluq.com), Muhemmed Erdem latin yéziqining jem’iyette qollinilishi we bashqa jehetlerde qimmetlik pikirlerni bergenlikige rehmet. Metbuat we Teshwiqat Orunliri Shinjang Téliwiziye Istanssi, ürümchi Kéchlik Géziti (muxbir: Niyaz), Shinjang Géziti, Shinjang Ishchilar Waqit Géziti, Shinjang Uniwérsitéti Géziti, merhum “Makanim” tor békiti, Misran tor békiti, Oyghan tor békiti qatarliq orunlarning ULY ni TOGHRA teshwiq qilighinigha rehmet. Bashqilar ULY ni birlikke keltürüsh yolida ilmiy yusunda selbiy pikirlerni bérip, meqsetni aydinglashturushqa yardem qilghan hem munazire mezmunini béyitqan kishilerge rehmet. ULY ni ishlitip tor békiti yasap toghra teshwiqat élip barghan, we ULY gha ait yumshaq détallarni yasighanlargha rehmet. Uyghur Latin Yéziqi yeni Uyghur Kompyutér Yéziqi (ULY) bilen xet yazghanda töwendiki qaidiler boyiche yézish kérek. 1. Jümlining birinchi sözining bash herpi chong herp bilen yézilidu. 2. Adem we nersilerning isimliri, dölet namliri, milletlerning namliri we yer-jay isimlirining bash herpi chong yézilidu. 3. Xas isimlarning bash herpi chong herp bilen yézilidu. Chettin kirgen xas isimlar Uyghur tiligha boy sundurup yézilidu, esli shu tilda yézilishini tirnaq ichige élip qoysimu bolidu. 4. Qisqartilghan isimlar chong herp bilen yézilidu. 5. Xelq’ara birlikler, qisqartilma sözler we tawar namliri öz péti yézilidu. 6. Qisqartilghan sözlüklerning ichide qoshma herp bolsa shu herpning birinchi herpi chong yézilip ikkinchi herpi kichik yézilidu. 7. Memuriy orunlarning namlirining bash herpi chong herp bilen yézilidu. 8. Yuqirikilerdin bashqa ehwallarda herpler birdek kichik yézilidu. 9. Melum sözde bir boghum uzuk tawush bilen axirlashsa shu boghumning arqidin kelgen yene bir boghum sozuq tawush bilen bashlansa, bu ikki boghum apostrof (‘) bilen ayrip yézilidu. 10. Melum sözde bir boghum sozuq tawush bilen axirlashsa shu boghumning arqidin kelgen yene bir boghum sozuq tawush bilen bashlansa, bu ikki boghum apostrof (‘) bilen ayrip yézilmaydu. Chünki, Uyghur gramatikisi boyiche yeni Uyghur tilida her bir boghumda bir sozuq tawush bolidu, ikki sozuq tawushning arqimu-arqa kélishinig özila boghum ayrishning bisharitidur. 11. Perqlendürüp oqushqa asan bolush üchün s’h, n’gh, n’g, ng’h arisighimu apostrof qoshup qoyilidu. Is’haq, Özbékistan’gha, Hin’gan, Cheklen’gen, Ganggirap, Bashlan’ghuch. 1. PSD format (22 mb): basqandiki éniqliq derijisi eng yuqiri. Uni échish üchün kompyutéringizda Adobe Photoshop we UKIJ Tuz Tom dégen font bolishi kérek. 2. PDF format (685 kb): basqandiki éniqliq derijisi ottura hal. Uni échish üchün kompyutéringizda Adobe Acrobat Reader bolishi kérek. 3. GIF format (2.08 mb): basqandiki éniqliq derijisi yuqiridikilerdin töwen. Eskertish: Eger teshwiqat qilishni xalisingiz, yuqurdiki tepsilatlarni yaxshi oqung. “Yéziq özgertidikenmiz …” , “UKY ni ishlitish Uyghur kona yéziqini islaha qilish…” dégendek xata teshwiqat élip barsingiz ashkara tenqid qilinisiz. © Bu matéryallar delil ispatlargha asasen Oyghan.com din Waris A. Janbaz we Misran.com din Abduréhim teripidin teyyarlandi. Paydilansingiz bashqilarning emgikige hörmet qilish yüzisidin “Uyghur Kompyutér Ilimi Jem’iyiti http://www.ukij.org din” yaki yuqurdiki tor béketlirining biridin élindi dep eskerting. Most Westerners have been introduced to Omar Khayyam through Edward Fitzgerald’s 1859 popular translation of nearly 600, four-line poems known as the Rubaiyat. That collection profoundly influenced perceptions (and misperceptions) of Persia at the time. Amin Maalouf, a Paris-based Lebanese writer who won the Prix Goncourt in 1993, sets the record straight in his marvellous blend of fact and fiction, Samarkand. The novel not only imagines the history of the manuscript of the Rubaiyat, it recreates the city of Samarkand in the 11th century AD, a renowned centre of beauty and learning. In the Islamic world, Khayyam is celebrated as a mathematician and astronomer. After studying philosophy at Nishapur, a hub of culture and civilization, Khayyam travelled to Bukhara, where he frequented the renowned library of the Ark, as had Avicenna earlier. In 1070 he moved to Samarkand where he was supported by Abu Tahir, a prominent Samarkand jurist; this support allowed him to write his most famous algebraic work, the Treatise on Demonstration of Problems of Algebra. This treatise contained a complete classification of cubic equations with geometric solutions found by means of intersecting conic sections. Khayyam also provided an interesting historical account in which he claims that the Greeks had written nothing on the theory of cubic equations. Indeed, Khayyam states that earlier writers such as al-Mahani and al-Khazin contributed significantly to the translation of geometric problems into algebraic equations (something which was essentially impossible before the work of the 9th century polymath Al-Khorezmi, who was born in Khiva). However, Khayyam himself seems to have been the first to conceive a general theory of cubic equations. Khayyam left Samarkand in 1073 at the invitation of Malik Shah, ruler of Isfahan, to set up an observatory there. For 18 years he and other leading scientists and astronomers produced work of outstanding quality. He led significant studies on compiling astronomical tables and he also contributed to calendar reform: in 1079 Khayyam measured with astounding accuracy the length of the year as 365.24219858156 days. Today we know that a year’s length is 365.242190 days. The calendar, known as the Jalali calendar, was used throughout the Perisan empire until the 20th century and, following a modification in 1925, is the basis of the modern Iranian calendar. Omar Khayyam died in 1131, aged 83, and his mausoleum in his hometown of Nishapur is visited by hundreds of thousands of people every year. The mausoleum’s interior and exterior walls are decorated with his quatrains inscribed as inlaid tile works. His life and work has inspired many movies, most recently the 2005 film The Keeper: The Legend of Omar Khayyam, written and directed by US-based Iranian director Kayvan Mashayekh. Try to find a copy at your library or DVD store, as it was filmed mostly in Khiva and Bukhara. And please try to pick up a copy of Maalouf’s Samarkand, published in Abacus paperbacks. It’s an evocative and beautifully written story. ‘Psycology Today’ dergisinde yayınlanan bilimsel bir çalışmaya göre, vücudumuzdaki ağrıların fiziksel sebeplerinin yanı sıra duygusal sebepleri de olabilir. Buraya kadar normal, çünkü hepimiz stresin bir takım ağrı ve acıları tetiklediğini biliyoruz. Ancak bu çalışmada hangi duyguların hangi bölgeleri etkilediğini de ortaya koymuş. Özellikle fiziksel sebebi saptanamayan kronik ağrıların sebebinin çözülemeyen travmalar olabileceği iddia edilmiş. Hepimizin tahmin edebileceği gibi baş ağrısının en önemli sebeplerinden biri gün içerisinde yaşanan stres, bu stresten kaynaklı kasılmalar ve rahatlayamama, düzensiz nefes almak ve beyne giden oksijenin azalması. Bu çalışmaya göre kronik boyun ağrısının arkasında insanları affedememek ve kin beslemek yatıyor olabilir. Koy verin gitsin, tatlı canınızdan değerli mi? Herkesi affettim ama ağrım geçmiyor diyorsanız biraz egzersiz işe yarar belki. Omuz ağrısı duygusal bir yükü taşımayı ifade edebiliyormuş. Bu yük bir başkasının size yüklediği yük de olabilir, bir suçluluk duygusu da. Bel ağrısının sebebi maddi kaygılar ve gelecekle ilgili dünyevi endişeler (ev, iş, para, geçim derdi) olabiliyormuş. Belini doğrultamamak terimi tesadüf olabilir mi? Psikologlar ellerimizin diğer insanlarla olan iletişim araçlarımız olduğunu ifade ediyor, bu sebeple vücut dilimizde en çok ellerimizi kullanıyoruz. Ellerimizde duyduğumuz ağrının kaynağı da iletişim eksikliği, anlatmak isteyip anlatamadıklarımız, kendimizi ifade edemeyişimiz olabilir. Kalçaların ve dirseklerin değişime en çok direnen bölgeler olduğu söyleniyor. Hayatımızda büyük değişiklikler yaşadığımızda, koşa koşa seve seve değiştiğimizi düşündüğümüz zamanlarda bile kalçalarımız ve dirseklerimiz bu değişime direniyor ve düzeni korumak istiyor olabilir, böyle durumlarda ise sinyal veriyorlarmış. Diz Ağrılarının sebebinin yüksek ego, kibir ve kendini beğenmişlik olduğu düşünülmüş. Biraz tevazu lütfen. Bacak ağrılarının kişinin kendine güvensizliği, yetersizlik duygusu ve kıskançlıkla tetiklendiği düşünülüyor. Vücudun bütün yükünün ayaklarımızda birikmesi gibi, kötümserliğimizin olumsuz etkileri de ayakları etkiliyor, umutsuz başın cezasını ayaklar çekiyor. Mitoloji Türkçe, ”Söylence Bilim” anlamında kullanılan bir kavramdır. James Churchward’ın (1851-1936) Mu Kıtası ile ilgili araştırmaları da işte bu “Söylencelerin” derlenmesine dayanır. Bu yüzden Mu ile ilgili söylenceleri ve anlatıları önemsiyorum. İnsanlığın bilinçaltında kayıtlı olan tüm gizemli “Gerçekleri” bu söylencelerde bulabiliriz. Bilinçaltında, arketipik kültür kodları dediğimiz, semboller ve simgeler vasıtası ile tutulan ve anlatılan bu efsaneler, gerçek yaşanmış olaylar olabilir. Bu olaylar masalsı ve şifreli bir dille ve sözlü kültür aracılığı ile kuşaktan kuşağa aktarılır. İnsan bilinci gerçek yaşanmış olayları hafızasında ancak “mitleştirerek” tutabilir. Buna “Mitolojik Hafıza” da denebilir. Ünlü dinler tarihi uzmanı Mircea Eliade’ya göre gerçek yaşanmış tarihi olaylar 200-300 yıl sonra mitolojiler ve masallar dünyasına dahil olur. Mitolojiler insanoğlunun daima ilgisini çekmiştir ve çekmeye de devam edecektir. Bunun en önemli sebebi gizemli bir dille anlatılmaları ve yazılmalarıdır. Resim1: Pasifik Okyanusunda yaşanan bir tufan sonucu sulara gömüldüğü söylenen Mu Kıtası. 19. yüzyılda “Sözlü Kültürün” derlenmesi, Alman Jacop ve Wilhem Grimm kardeşler ile başlar. Köyleri ve kasabaları dolaşarak yüzyıllar boyunca anlatılan masalları, efsaneleri derleyerek yazılı hale getirmiş ve yayınlamışlardır. Onlar, diğer milletlerin kendi efsane destan ve mitolojilerini derlemelerine kapı açmıştır. Finler Elias Lönrot aracılığı ile Kalevala gibi bir destana sahip olduklarının farkına varmıştır. Ve böylece “Batılılar” yüzyıllardır kendi kültürlerinin temeli zannettikleri, Yunan mitlerine ait olmadıklarının farkına varmıştır. Ya da Hıristiyan kültüründeki Yahudi-Sami mitlerine. James Churchward’ın Pasifik Okyanusunda battığı varsayılan Mu Kıtası ile ilgili söylenceleri derleme çalışmaları da 20. Yüzyıl başlarına dayanır. Arkaik dönemde insanlar yazılı bir arşiv ve kültürleri olmadığı için bir çok bilgiyi sembol ve simgeler aracılığı ile gelecek kuşaklara aktarmıştır. Okumasını bilene bu simgeler çok şey ifade eder. Türkler bu sembollere Tamga adını verir ve bu soyut sembolleri en çok kullanan millet de Türk milletidir. Türkler, eskiden göç ettikleri coğrafyalardaki kayaların üzerine kendi mantık ve düşünce sistemlerini, yaşayış tarzlarını, inançlarını, aile ve boy tamgalarını, kazımışlardır. Hatta hayvanlarına ve özel eşyalarını belirlemek için bu sembolleri kullanmıştır. Eberhard’a göre soyut sanatın yaratıcısı Türklerdir. Arkaik dönemlerden bu yana, Türklerin kullandığı “tamgalar” işte bu “Stilize” edilerek anlatılmaya çalışılan sırlı işaretlerin temelini oluşturur. Soyut sanatın yaratıcısı Türkler olduğuna göre, bu soyut sembol ve ikonografileri, Türk tarihinin ya da “Türk Söylencesinin” kökeninde yani Mu uygarlığı bağlamında da araştırmak gerekir. James Churchward ve Willam Niven’in Tibet ve Meksika’dan elde ettikleri veriler sadece söylencelerden ibaret değildi. William Niven’in Meksika’da Mu ile bağlantılı topladığı tabletler 3000’in üzerinde idi. Churchward bu tabletlerin 12 000 yıllık olduğunu söyler. Tabletlerin üzerinde kozmoloji ile ilgili çeşitli ikonografiler ve simgeler yer alır. 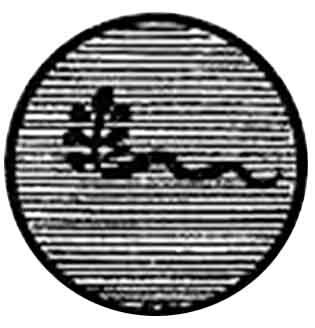 Churchward bu ikonografileri “Kutsal ve Mülhem” olarak niteler. Seçtiği bu kelimeler oldukça önemlidir. Diğer tüm ikonografiler gibi “Kutsal” yani Tanrısal kaynaklı olduğunu ve “Mülhem” yani özel insanların bilinçaltına “İlham” edildiğini yazar. Bachofen’e göre söylence “simgenin yorumudur”. Ona göre, insan bilincinden çıkan duygu, düşünce, imgeler ve örüntüler, önce simgesel biçimler olarak, sonrada söylence ve mitolojilere dönüştürülerek hayat bulur. Eskiçağ sanatı, en derin ve sürekli biçimde simgelerden yararlanmıştır. Peki simge ve sembollerin ilk kaynağı nedir ya da neresidir? Platon’a göre; bu imgeler idealar dünyası olarak tanımladığı, uyumakta olan dölyatağından çıkar. Ünlü psikanalist C. Gustav Jung’a göre de “İmgeler ve Simgeler” Tanrısal bir kaynaktan bilinçaltına gelen bir çeşit enerjidir. Peki neden insanoğlu ilk bakışta anlaşılamayan bu semboller ile bir takım gizli gerçekleri ya da söylenceleri ifade etmeye çalışmıştır? Herkes tarafından anlaşılmasın diye mi? Arkaik insan için sözcükler ile gizemli şeyleri ifade etmek, Tanrıya saygısızlık olurdu. Bunlar ancak mitolojik simgeler aracılığı ile ifade edilebilirdi. Gizemli anlatıların bilinçaltında daha kolay anımsanması ve bir sonraki kuşağa aktarılabilmesi için masalsı bir dille ve semboller ile anlatılması da buna sebep olmuş olabilir. Tarih boyunca “Kutsal” olan daima gizemli ve bilinmeyen olarak kalmıştır. “Tanrı” işte bu bilinmeyendir ve ancak imge ve simgeler ile anlaşılmaya çalışılan bir gizemdir. Simgeler ruha, sözler dış dünyaya hitap eder. Bir başka soru bu söylenceleri ve ikonografileri kimlerin yarattığıdır.Çağlar boyunca insanoğlu, bu söylenceler ve simgeler aracılığıyla, “Bilinmeyen” ile iletişim kurmuştur. Tüm bu “Sözlü Kültür” ve “Yazılı Kültür” tasarımlarını yaratanlar ve ortaya çıkaranlar, ait oldukları toplumun “Ortak Bilinçaltını” bilen ve hafızalarında tutan özel insanlardır. Bunlar bulundukları toplumu etkileyen ve harekete geçiren, Şamanlar, Ozanlar, Bilgeler, Peygamberlerdir. Sözlü ve Yazılı Kültür Mirası taşıyıcıları olarak çok önemli bir misyon üstlenmişlerdir. Bir Yakut Şamanının sözlü kültür hafızası 12.000 kelimeden ibaretken, normal insan kapasitesi 4000 sözcük barındırır. Churchward’da Mu Kıtası ile ilgili kadim bilgileri Tibet ve Hindistan’daki rahiplerden derlemiştir. Eliade’ya göre; kadim uygarlıkların bilgileri ve bunların kökenleri hakkındaki bilgiler, mitlerden, simgelerden ve geleneklerden edinilebilir. Bu kaynaklar yaşayan fosillerdir. Kimi zaman tek bir fosil, temsil ettiği bütün organik sistemi açığa çıkarmaya yeterlidir. Tüm bu tespitler “Mu Kıtası” Mitolojisi ya da Söylencesi ve Mu Kıtası ile ilişkilendirilen Simge ve İkonografileri daha kolay çözümleyip anlamamıza yardımcı olacaktır. Ben daha çok bu makalede bunların üzerinde duracağım. Mu kıtası, Pasifik okyanusunda yani Asya ile Amerika kıtası arasında, 14 000 yıl önce var olduğu düşünülen ve çeşitli nedenler ile sulara gömüldüğü söylenen bir kıtadır. İngiliz subay ve araştırmacı James Churchward Tibet ve Hindistan’da Rahiplerden derlediği söylenceleri ve Mu kıtası ile bağlantılı gördüğü tabletleri bir araya getirdi. 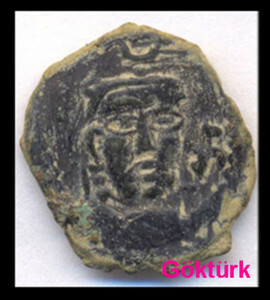 O’na göre kıta deprem ve tufan gibi doğal bir afet ile 12 000 yıl önce batmıştı. Mu kıtasından göçler Kuzey ve Güney Amerika’ya ve Orta-Asya’ya yapılmıştır. Yine Churchward’a göre Avrupa’daki tüm Ari kavimlerin, Kelt, Bask ve İskitlerin ataları, 70 000 yıl önce Orta Asya da var olduğunu düşündüğü Uygur İmparatorluğunun batıya göç eden torunlarıdır. Hatta Osiris de Mu kıtasında eğitilmiş, daha sonra Atlantis ve Mısırda dini reformlar yapmıştır. Resim2: 70 000 yıl önce var olduğu söylenen büyük Uygur İmparatorluğu ve Pasifik Okyanusundaki Mu Kıtası. Churchward’ın bu araştırmaları elbette Atamızın da dikkatini çekmişti. Özellikle Uygur Türklerinin de bu mitolojik anlatı ile bağlantısının olması O’nu heyecanlandırmış olmalı. Churchward’ın konuyla ilgili kitaplarını getirterek okudu. Daha sonra Maya-Tepek soyadını vereceği Meksika Maslahatgüzarı diplomat Tahsin beyi bu konuda görevlendirdi. Tahsin bey Maya dili ve Türk dili arasındaki benzerlikleri ortaya koydu. 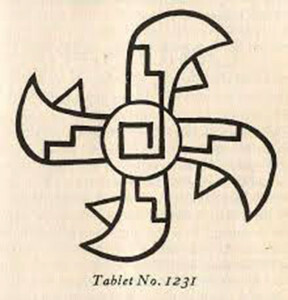 Churchward bu Mu Kıtası ile ilgili bilgileri Hindistanda çok eski bir dil olan “Naga Maya” dili ile yazılmış “Naacal Tabletleri” nden aktarır. Daha sonra arkeolog William Niven ile tanışır. O’nun Meksika’da bulduğu tabletleri de Tibetli Rahiplerden öğrendiği Naga Maya dili yardımıyla okur. Peki bu dil bizim anladığımız bir dil ve en önemlisi yazımıdır?. Ya da simge ve ikonografilerden oluşmuş çizimler midir?. Churchward bunları nasıl okumuştur? Churchward’ın kitaplarından anlaşıldığı kadarı ile bu dil simge ve sembol dilidir. Bu sembollerin ne anlama geldiklerini de bu kutsal bilgiye sahip olan Tibetli rahiplerden öğrenmiştir. Bunlar tamamen dini ve mitolojik öğretilerde ve inisiyasyon ritüellerinde kullanılan simgelerdir. Eliade’ya göre bu ritüeller erginlenecek olan adayı bir üst bilince taşır. Kişi farklı bir sosyal ve dini statüye geçer. Tanrılar kozmoloji, yaratılış ve köken mitleri ile ilgili tüm sırları öğrenir. Needham’a göre arkaik insan ilk önce, ikili ve dörtlü mantık ve düşünce sistemine göre çevresindeki ve gökyüzündeki varlıkları sınıflandırmıştır. Mu Kıtası ile ilgili simge ve sembollerin yorumunda da, ikili-dörtlü ve de çoklu mantık sistemleri kullanılmıştır. Önemsediğim simgelerden ilki Churcward’ın “Kozmik Güçleri” ifade ettiğini düşündüğü ve biz Türklerin Çarkıfelek adını verdiğimiz İkonografidir. Bu 4’lü simge aslında evrenin kutup yıldızı etrafındaki döngüsünü ifade eder. Zamanla düşünce sistemleri değiştikçe ve bilinç düzeyi arttıkça yeni metafizik güçleri içinde barındıran kutsal bir sembol haline gelmiştir. İlerleyen zamanlarda insanoğlu simge ve sembollere, yeni ikonografik anlamlar yüklemiştir. Hatta en son Hitler bu simgeyi büyük kitleleri harekete geçirmek için kullanmıştır. Churchward’ın Mu Alfabesinde gördüğü harflerden biri de bu çarkıfelek sembolüdür. Bu sembolün benzerlerine Orta Asya’daki Bengütaşlar ya da Geyikli Taşlar üzerinde rastlanır. Resim3: Soldaki resim Churchward’ın kitabındaki Mu Alfabesindeki işarettir. Sağdaki resim ise Emel Esin’in Türklerde Maddi Kültürün Oluşumu kitabındaki Bengütaşlar üzerinde gösterilen ikonografidir. Aradaki benzerlik çok şaşırtıcı..
Resim4: Göktürklere ait bu paradaki Kağanın solundaki çarkıfelek ikonografisi. M.S. 6-7.yy. Gökyüzündeki Büyükayı Takımyıldızının dönüşü 4 ana mevsimi belirler. Arkaik dönemlerde insanlar mevsimleri bu döngüye göre hesaplardı. İnsanoğlu dik duruş sayesinde ön, arka, sağ ve sol kavramlarını geliştirmiş ve yeryüzünü de 4 ana yön olarak düşünmüşlerdir. Güneşin doğuşu ve batışı da yön bilincini oluşturmuştur. Dörtlü sınıflandırmalardan bir diğeri Churchward’ın kozmik güçler adını verdiği dört temel elementtir. Hava, Toprak, Su ve Ateş. Resim5: Kırgızistan Saymalıtaştaki Çarkıfelek petroglifi. Gökyüzündeki izdüşümü Büyükayı Takımyıldızıdır ve bu takımyıldızın gökyüzünde aldığı pozisyonlar mevsimleri oluşturur. Resim6: Niven’in Meksika’da bulduğu tabletler üzerindeki Çarkıfelek çizimi. Churchward, evrenin dönüşünü ve yaratılışı kozmik güçlerin oluşumuna bağlar. Kozmik güçler ona göre 4 büyük güçtür. Bu 4 büyük kozmik güç bir araya gelir ve yaratılışı başlatır. Kozmik güçler 4 ana elementtir. Mu’nun bu 4 ana element bağlamında anlatılan yaratılış ile ilgili söylencesi şu şekildedir. Gazlar dönen sarmal şeklinde kitleler halinde bir araya gelir, sonra soğur ve katılaşırlar ve gezegenleri meydana getirir. Bu şekilde Toprak oluşur. Atmosferdeki gazlar ayrışır ve Sular meydana gelir. Yerin içindeki ateş toprak yüzeyine çıkar ve Ateş oluşur. Türkler diğer milletlerin efsanelerinde “Naga-Nagi” yani Ejderha-Yılan İnsanlar olarak adlandırılır ve tasvir edilir. Elbette bu adlandırmaların çok da iyi niyet taşımadığı açıktır, fakat yine de Türklerin Ejderha yani Nagalar ile özdeşleştirilmesi dikkate alınmalıdır. Çin yaratılış mitlerinde yer alan ve Uygur Türklerinin de tabut örtülerinde kullandıkları, birbirine dolanmış alt tarafları yılan olan kadın ve erkek ikonografisi, yaratılışı ve ikili zıtlıklar kuramını anlatması bakımından önemlidir. Resim7: Uygur Türklerine ait tabut örtüleri. Fuxi ve Nüwa. Ellerinde gönye ve pergel tutarlar. Evrenin yüce yaratıcısı ve mimarı anlamına gelir ve masonlardan binlerce yıl önce Orta Asya’da kullanılmış simgelerdir. Yaratılış mitlerinin büyük çoğunluğu, Hayat Ağacı, Hayat Suyu, Kozmik Yılan ya da Ejderha ile bağlantılı ikonografiler ve anlatılar ile doludur. Churcward’ın Mu Kıtası ile bağlantılı gördüğü tabletlerde de bu ikonografiler mevcuttur. Resim8: Churcward’ın Mu Kıtası ile ilişkilendirdiği semboller. Hayat Ağacı ve Yılan İkonografisi. Mitolog Joseph Champbell’a göre; İkonografilerde “Galaktik Merkez”, ejderhanın ağzından çıkan ya da bir yılanın sarmalandığı, “Hayat Ağacı” ile sembolize edilen, samanyolu galaksisinin “Merkezi” noktasıdır. Burası eski insanlar tarafından yaratılışın ve hayatın başladığı yer olarak kabul edilir. Hayat Ağacı bu noktadan büyür ve köklerinde ya da etrafında büyük bir yılan ya da ejderhanın olduğu düşünülür. Eliade’ya göre yılan yaratılışın, sonsuz suların ve yeniden doğuşun alegorik sembolüdür. Mu kıtası ile ilgili ikonografilerden bir diğeri yine yılan ve sonsuz suları gösteren bir resimdir. Resim9: Churcward’ın Mu Kıtası ile ilişkilendirdiği bir diğer sembol. Sonsuz Sular ya da Hayat Suyu ve 7 başlı Ejder-Yılan İkonografisi. Campbell’a göre; sonsuz sular ya da hayat suyu da evrenin simgesel döngüsünün merkezi olan Galaktik Merkezden çıkar. Bu merkezi kaynağın altında Ejderha ya da Kozmik Yılan vardır. Hayat Ağacı yani evren bu noktadan büyür. 9 no’lu resimde Evrenin Yaratılışı, Kozmik Sular ve Kozmik Yılan-Ejderha ile ifade edilmiştir. Fakat önemli bir ayrıntı Mu ve Türk mitolojisi arasındaki benzerliği ortaya koyar. Resimdeki Ejderha görüldüğü gibi 7 başlıdır. Türk mitlerinde ay genellikle “Ay Dede” olarak nitelenir. Ay dede ile 7 başlı ejderhanın yani Yelbegen’in savaşını anlatan Altay masalları hem Türklerin kozmoloji anlayışı hem de Astronomi anlayışıyla yakından ilgilidir. Yel Büke 7 başlı ejderha anlamındadır. Türk sanatında yaratılışın başlangıç yeri olarak görülen Galaktik Merkez ve Galaktik Merkezden çıktığı varsayılan Ejderha ikonografisi 7 başlı olarak sembolize edilir. Bunun nedeni 7 rakamının kozmolojik anlamının olması ve gökyüzündeki yedi gezegeni ifade etmesidir. Bu sayılar elbette ilk önce yaratılış ve kozmolojik açıdan incelenmelidir. Churcward’a göre de Mu 70 000 yıl önce yaratıcının 7 emri ile yaratılır. Bu 7 emir elbette 7 gezegen ile ve diğer yedili yıldız grupları ile alakalı kozmolojik bir sayıdır. Haftanın 7 günü de bu 7 gezegen ile ilişkilendirilir. Görüldüğü gibi Mu Kıtasının yaratılış söylencesi ile ilgili verilen sayılar tamamen kozmolojik sayılardır. 70 000 rakamı da bu nedenle anlamlıdır. Kuş ve Yılan ikiliği mitolojilerde ve ikonografilerde sık rastlanan motiflerdir. Kuş çoğunlukla Kartaldır ve Güneş ile, Yılan ise Ay ve sular ile ilişkilendirilir. Resim11: Niven’in Meksika’da bulduğu tabletlerdeki kuş ikonografileri. Türklere ait ikonografik sanat eserlerinde Hayat ağacının köklerinde Ejderha-Yılan ve tepesindeki dallarda Güneş kuşu olan Kartal vardır. Resim12: 12.yy. Selçuklu seramik tabak. Ejderhanın ağzından çıkan hayat ağacı ve dallarında bekleyen ruh kuşları. Bir diğer önemli gördüğüm ikonografi Davut Yıldızı ya da Süleyman Mührü olarak bilinen 6 uçlu yıldız simgesi. Bu sembol her ne kadar Musevilik ile ilişkilendirilmiş olsa da, Hun’lar ve onların bir boy’u olan Türkler tarafından eski çağlardan bu yana kullanılagelmiştir. Mu kıtası Kozmik Diagramı olarak çizilen İkonografi yaratılışın simgesel anlatımı gibidir. En dıştaki “Güneş Rozeti” ya da “Güneş Çiçeği” olarak adlandırılan simge 12 dilimlidir. Güneşin 1 yıllık dolanım süresini ve 12 takımyıldızın diagram çizimini gösterir. 6 uçlu yıldız, aşağı ve yukarı bakan iki üçgenden oluşur. Ezoterik tradisyonda eril ve dişil ögeyi ve tüm zıtlıkları ifade der. İkili zıtlıklar kuramı, insanoğlunun evreni ve kendini anlamlandırmasına yardımcı olan bir mantık ve düşünce sistemidir. Yıldızın ortasındaki daire ve nokta sembolü Türk runik harflerindendir. “Gün” ve “Ant” olarak okunur. Jung’a göre “Tanrı” ya da “Öz Ben” simgesidir. Günümüz Astrolojisinde de Güneş olarak okunur. Güneş hayatın kaynağı ve Tanrının yaratıcı gücünü gösterdiği en önemli gök cismidir. Güneş Rozetinin altından uzanan 4 ışık, 4 ana element yani Hava, Toprak, Su ve Ateş olarak yorumlanabilir. Tüm bu güçler, “İkili Zıtlıklar” ve “Dört Kozmik Güç” yani unsurlar birleştiğinde yaratılış gerçekleşir. Resim13: Noin Ula Kurganında bulunan Türk-Hun Tamgaları ve Altı Uçlu Yıldız, M.Ö. 2.yy. ve Mu Kıtasının Kozmogonik Diagramı. 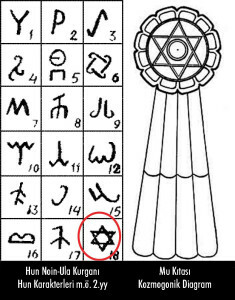 6 uçlu yıldız yani Hexagram sembolünü Tekeoğulları Beyliği bayrağında, Barbaros’un sancağında, yeniçeri başlıklarının üzerinde, camilerde, mezar taşlarında, paraların üzerinde ve diğer sanat eserlerinde görebiliriz. Bu simge Türklerin kadim takvimlerinin başlangıcı sayılan Ülker takımyıldızını da ifade eder. Türkler bu yıldızı çok önemser. Her yıl Mayıs ayında Hıdrellez kutlanır. Bu, Ülker’lerin gündüz göğünde Güneş ile birlikte yükseldiği dönemdir. İnsanlar bahar döneminde, yeniden doğuşu canlandıran ritüeller yaparlar. Yaratılışın tekrar ettiğini ve doğanın her yıl yeniden uyandığını düşünürler. Resim14: 6-7.yy Türk Uygur Budist Derviş’in kolunun altındaki sembol Hexagramdır. Aynı sembol Osmanlı döneminde yeniçerilerin başlıklarının üzerinde de yer almıştır. Bir diğer veri Mu İmparatorluğunun “Güneş İmparatorluğu” olarak adlandırılmasıdır. Bu tanım Mu kıtasının Batılılara göre Doğu yönünde ve kıtanın “Anakara” olması ile ilişkilendirilebilir. Söylencelerde Güneş’in yaratıcı gücü ile ilk insanın bu topraklarda yaratılmış olduğu inancı vardır. Bu nedenle Mu kıtasına Ana-Kara adı verilmiştir. Churchward’a göre Mu halkının başlıca simgeleri güneşti ve tek bir yaratıcıya güneş aracılığı ile tapınıyorlardı. Şunu da eklemek isterim. Güneş diğer dünya mitlerinde “Eril” bir özelliğe sahipken, Türk mitolojisinde “Dişildir” ve “Gün-Ana” olarak ifade edilir. Resim15: Türkler Güneş İkonografisini her dönemde kullanmışlardır. Soldaki resim Uygur Türklerinin Budizm dönemine ait bir Uygur Alp heykelidir. Göğsünün iki yanında Güneş simgesi açıkça görülür. İlhanlı, Altınordu ve Selçuklu paralarının üzerinde de Güneş sembolizmi kullanılmıştır. Churchward’ın, Güneş ile ilişkilendirdiği ve Uygurların simgesi olarak gördüğü iç içe geçmiş daire ikonografisi. Orta Asya’daki 70 000 yıllık büyük Uygur İmparatorluğu ve Mu Kıtasındaki insanlar tarafından kullanılıyordu. Churchward’ın ifadesini aynen İngilizce olarak aktarıyorum. The eye of the bird is the Uighur form of the monotheistic symbol of the Deity. “Kuş gözü, Uygur tek Tanrılı dininin sembolüdür.” İç içe geçmiş daire sembolü çok değerli Emel Esin’e göre de bu sembol “Kün” yani Güneş olarak okunur. Uygur Türkleri bu sembolü hilal ile birlikte Ay-Kün olarak kullanmışlardır. Uygurlar Ay ve Kün Tengri ifadesini kullanırlardı. Uygur kağanlar tahta çıktıklarında Ay ve Güneşten kut alırdı. James Frazer “Altın Dal” isimli kitabında yeni evlenen Orta Asya’daki Türklerin, sabah doğan güneşi selamladığını yazar. Bu uygulama farklı bir sosyal statüye geçiş ve dolayısıyla yeni bir hayata başlama ritüelidir. Güneşin yaratıcı gücüne saygı duyma, bolluk bereket dileme ve çok çocuk sahibi olma isteği ile de alakalıdır. Resim16: Uygur Türklerine ait Ay-Kün ikonografileri. Daire içindeki noktalı simge Türk Runik harflerindendir ve “Gün” yani “Güneş” olarak okunur. Meksikada bulunan ve yine batık Mu Kıtasından taşındığı varsayılan simgelerden bir tanesi de daire içindeki artı sembolüdür. Resim17: 2. ve 3. Sembol Meksika’daki tabletler üzerindeki İkonografilerdir. Türkçe “Tanrı” olarak okunur. Ünlü psikanalist C. Gustav Jung’a göre insanlığın en eski ve en ilkel Tanrı İkonografisi budur. Bu sembol öyle evrenseldir ve dünyadaki kayaların üzerine kazınmıştır. Fakat çok ilginçtir ki Emel Esin’e göre de bu işaret Türklerin kullandığı Runik Alfabenin bir harfidir ve “Tanrı” olarak okunur. Resim18: Kırgızistan Saymalıtaş. Tanrı olarak okunan petroglifler. Artı yeryüzü ve yeryüzünün dört bucağını, daire ise gökyüzü ve gökyüzünün yuvarlak kubbesini ve sonsuzluğunu çağrıştırır. Aslında bu ikonografide Yeryüzü ve Gökyüzü dikotomisi ile yaratılıştaki eril ve dişil iki öge sembolize edilir. Churchward’ın Mu Kıtası arması ya da Tamgası olarak gördüğü simge, bir kaç anlamı içinde barındırır. Haç ya da artı sembolü dünya ve yeryüzünün dört bucağı olan kuzey, güney, doğu ve batı yönlerini ifade eder. Etrafındaki daire, yeryüzü ile gökyüzünün birleşmiş gibi göründüğü, 360 derece dairevi ufuk çizgisini ve gökyüzünün sonsuzluğunu anlatır. Bu iki sembol “Tanrı” olarak okunur. Çünkü Tanrı ezoterik düşüncede tüm zıtlıkları içinde barındırır. Armadaki dairenin etrafındaki sivri uçlar güneşi anımsatır. Güneş’i taşıdığı düşünülen “Güneş Tekerleği” 8 dilimlidir. Benzer ikonografiyi Türk sembolizminde de görebiliriz. Resim19: Mu Kıtası Arması ya da Tamgası. Tanrı ve Güneş olarak okur. 1873 yılında Osman Hamdi Bey tarafından fotoğraflanan, Ankara yöresi çoban kepeneği üzerindeki Tamga Mu kıtası arması ile aynıdır. Tanrı ve Güneş olarak okunabilir. Resim20: 13. yüzyılda yapılan Güneş Tapınağı ve Güneş Tekerleği. Hindistan. Türk Otağlarındaki Tengri Tamgası ve 8 dilimli çadır kasnağı. Churcward’ın Mu’nun sayısal ve simgesel sembolü olarak gördüğü 3 ve üç dilimli dağ İkonografisi. Ve bu dağın üzerinde “Güneş Diski” durmaktadır. Fakat resimdeki semboller tamamen siyahtır. Churchward bunu Mu’nun karanlığa gömülmesi olarak yorumlar. 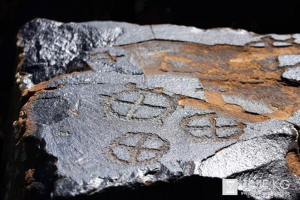 Aynı İkonografi Çin’de bulunan Paleolitik çağa ait bir kap üzerinde de vardır. Dağ şeklindeki sembolün üzerinde bu sefer Hilal Ve Güneş vardır. Resim21: Üç dilimli dağ şeklinde gösterilen kara parçası Mu Kıtasını ifade eder. Churchward bu sembolizmi, tufan sonrasında Mu’nun sulara gömülmesi olarak açıklar. Çin’de bulunan ve Paleolitik çağa ait bir kap üzerinde ise Kozmik Dağ üzerinde yükselen Hilal ve Güneş ya da tam Türkçe tabiri ile Kün-Ay İkonografisi görülür. Kozmik kara parçası bu sefer 5 dilimlidir ve kanımca 5 Ana Karayı ifade ediyor olabilir. Türklerde Maddi Kültürün Oluşumu, Emel Esin, Kabalcı Yayınları, 2003. Türk Sanatında İkonografik Motifler, Emel Esin, Kabalcı Yayınları, 2003. Türk Kozmolojisine Giriş, Emel Esin, Kabalcı Yayınları, 2001. Kayıp Kıta MU’nun Kozmik Güçleri 1, James Churchward, Ege Omega Yayınları, İstanbul, 2009. Kayıp Kıta MU’nun Kozmik Güçleri 2, James Churchward, Omega Yayınları, İstanbul, 2010. Éytsam Tilim, èytmisam Dilim köyudu. Herqandaq bir toplumda Wetenige, Millitige , Ailisige, Dos-yarenlirige chin dilidin baghliq bolghan Sadaqet Insanalar bolghinidek, ulargha hem xiyanet qilidighan , xainliq qilidighan,wedisige wapa qilmaydighan ihanetchi Insanlarmu bar bolidu. Jümlidin biz Uyghurlardimu hem shundaq. Weten sirtida, hijrette yashawatqan Uyghur tomlumi arisida mundaq ehwallarmu mewjut elwette. Eslide bizdek mustemlikke astida yashawatqan ajiz Millet üchün ilip iytqanda hemde Ana wetendin nechche on ming km uzaqta yashawatqan Uyghur üchün Sadaqet bekmu muhimdur. Sadaqet biz Uyghur üchün az bir qisimlirimizningla Sadaqiti bolup qalmastin belki pütün bir Uyghur toplomigha has bolghan meniwi quwet membesi bolushi kirek. Sadaqetlik Uyghurlarning qelbi bolsa xundi künduzdiki on minglighan nürlirini bipayan zimingha mertlik bilen chichip turghan merdane Qüyashqa, kéchiliri jin-sheyatularning timisqilap yurgen, zulmetlik basqan zimin´gha yop-yoruq yuzi arqiliq sixiliq nürini chichip, yorutidighan ashu tolun Aygha oxshaydu. Sadaqetlik Uyghur bolsa Jenggiwar, Pidakar, Milletke muhebet bilen baghlighan, mert we peziletlik bolidu. Jenggiwarliq özining weteni üchün, kolliktipning janijan-jan memeti üchün, Milletning izzet-hörmiti kelgusi Iqpali üchün téz pukmey küresh qilish jenggiwarliq bolidu. Pidakarliq bolsa Uyghuristanning musteqqillighi üchün, heq üchün, heqiqet üchün, özing barlighini, hetta özining eziz jininimu bixishlash Pidakarliq bolidu. Jenggiwarliq bilen Pidakarliq bu ikkisi bir Milletning mejutlughini ipadileydighan zörur rohi quwettur. Uyghur Millitining hayatliq, mejutluq yoli pidakarliq bilen ichilidu, Musteqqilliq yoli bolsa jenggiwarliq bilen kéngiyidu. Shundaqla bugün Uyghurlarni dunyagha ashu Pidakarlar, Jenggiwarlar tonitiwatidu. Pidakar, Jenggiwar bolush peqet düshmenge qarshi jengde shéhit bolush digenlikla emes, bolupmu bizdek chet´ellerdiki Uyghurlarning hazirqi emeli sharaitidin élip iytqanda Uyghuristanning musteqqilighi üchün paydiliq bolghan barliq yollarda Pidakarliq , Jenggiwarliq körsitidh dimekliktur. Ilim-penni ügunush üchunmu pidakrliq, jenggiwarliq kirek. Bolupmu weten sirtidiki yash ewlatlar üchün ilim ügush biz Uyghur millitimizning kelgusi üchün bekmu muhim. Chonglirimiz üchünmu hili hem shundaq, bir döwlette 20 yil yashap turup, shu döwletning tilini tuzek bilmeydighan Uyghur qirindashlirimiz hile bar. Itipaqliq üchünmu Pidakrliq, Jenggiwarliq kirek. Nadametke tolghan bu Tariximizda minglighan on minglighan Jenggiwarlar, Pidakar qeqriman Oghol-qizlirimizning issiq qan bedilige kelgen ghelbini, Itipaqsizlighimizdin qoldin birip qoyghanlighimiz toghrisidiki téragidiyeler kurming. Heqiqi Musteqqilliq milli itipaqliq arqiliq kilidu. Jeng-kürehlerning ghelbisini emeliy kapaletke ige qilidighan qoshunni Itipaqliq arqiliq wujutqa chiqarghini bolidu. Biz Pidakarliqni , jenggiwarliqni mueyen kolliptipning mempeeti üchün , heq yol üchün, adalet üchün özining barlighini atash dep chüshinimiz. Emdi mushu xil bighishlashni emeliyetke, özimizning hazirqi realliqigha aylandurushta birinji bolup duch kilidighan nerse sexsi menpeet, öz nemsi we menmenchilik , yeni „Men“ning özidur. Peqet özini yéngeligen, öz nemsidin keckken, özining shexsi mempetini öz razimenligi bilen omomning menpeeti, omomning itipaq-inaqlighi üchün qurban qilghanliq Pidakarliq we Jenggiwarliq bolidu. bu ham Wenimiz Uyghuristanning musteqqillighi üchün ilinghan toghra yoldur. Shunga jahan Mutepekkurliri, Melliy penni ilim Alimliri, meyliy dinni ilim Alimliri bolsun, özini-özi yéngish , öz nepsi ustidin ghelbe qilishning zorurligi we ehmiyiti heqqide ajayip ötkur telimlerni birip qaldurghan. Mesilen mubarek Islam dinimizning rexbiri, Peyghembirimiz Muhemmed (s.a.v. ) özi ishtira qilghan we qomandan bolghan Uhud jingining ghelbisidin kiyin öz sahabiliri we pütkul muminlerge tolimu chungqur menilik qilip: „Biz hazir peqet kichik jihadlarda yengduq , chong jihad tixi aldimizda, u bolsimu (Jihadunnefisiy) öz nefsini özi yéngish jéngi „ digen . Pidarliq we Jenggiwarliq öz Ana wetini, öz Millitini söyushni , öz Millitige muhebet bilen baghlinishni quwet membesi qilidu. Mundaqche eytqanda ötup ketkn tarixnila eslep olturushla emes belki u tarixtiki ichinishliq tiradigiyelerdin eqli xulase chiqirip , köz aldimizdiki réalliqqa tepekkur nezerimiz bilen qarap, heqiqetni sözleshmu militimizge qilinghan bir Pidakarliq we Jenggiwarliq bolup hesaplinidu. Shunga ötken tariximizghila emes hazirqi emeliy exwalimizning Sehniliridin biri bolghan Hijrettiki Uyghurlar tomlumigha nezer közimizni artturdighan bolsaq. Biz Uyghurlarning ajayip isil arzu –armanliri , Millitmizning, Ana Wetenimizning musteqqilighi üchün körsitidighan ajayip Pidarkarliqi, Jenggiwarlighimiz bolsimu, emma ming epsus hemmimiz özimizni yéngelmigenligimiz üchün, bir birimizni itirap qilmasliq, herqaysimiz özimiz serdar, „Biz“ning bishi bolushni oylighanlighimiz üchün, bir gewdige uyushqandaq körunsekmu, emeliyette uyushqan gewde ichide yene her birsi öz aldigha arqa tirek xojayin tutup, ayrim shayka toplap, bir-birige ora kolap, yurgini üchünla , nurghun nazuk mesillerde ortaq bir pikirge kélelmeymiz. Pidakarliq bilen öz nefsimizni yéngip Itipaqlishalmighanliqimiz üchünla armanlimiz armanliqta, dertlirimiz dermanliqta qalmaqta. Mana mundaq aqiwetlerning kilip chiqishigha sewep bulushning özi Milletke qilinghan Ihanettur. Bir- birimizni söymeslik, bir-birimiz bilen muhebet bilen baghlanmasliq, bir-birimizni kechurmeslik pütüm bir tomlumgha qilinghan ihanettur. Uyghur xelqining mutepekkur alimi Elishir Nawayi mundaq digen :“ Muhebbet jullalap turghan bir göherki, u Insanliq tajisigha zinnet we qimmet biridu“ . Bu chongqur menilik tepekkur jewhiri bizge shuni ügütiduki Ang insanni haywandin ayrip turidighan enggushter bolsa , Muhebet –Söygu bolsa insanliq dunyasini chaqnitip turghan göherdur. Muhebet bilen tolghan tomlum mengu güllinidu. Muhebet bolsa bu Alemning güllinishidiki pütmes-tügumes quwet bembesidur. Bu alem Muhebbet, söygü bilenla menggu rawajlinidu. Uyghur millitining musteqqilighi, güllinishi üchün bir qurimas quwet membesi lazim bolup, u bolsimu bir-birimizge bolghan Muhebbet, söygidur. Bir-birini söymigen tomlumda shundaq bir illet bolidiki u bolsimu ortaq ishqa köyunmesliktur. Ortaq ishqa köyunmeslik bilen bir-birini söymeslik illitining munasiwiti sewep-netije munasiwiti bolup, bir-birini söymeslik, bir-birini qolimasliqtin ortaq ishqa köyunmeslik, ortaq paaliyetlerni qolimasliq kilip chiqqan. Bu tereqqi qilip öz ara düshmenlishish derijisige köturulgen. Qumdek chichilan’ghu jemiyettin peqet qumdek chichilan’ghu adem yitiship chiqidu. Bundaq bolushning özimu Milletke qilinghan bir ihanettur. Mining échindighinim elmisaqtin Qoy göshi yep adatlengen Uyghurlar Böre kelse Qoydek bir yerge toplushup, itipaqliship düshminige qarshi turushning ornigha, Choshqa göshi yimey turup, Böre kelse chiqirship, töt etrappqa tire-pireq bolup qachidighan Choshqining mijezini singdurginimizge ming epsuslinimen. Satqilliq bolsa Milletke qilinghan Ihanetning eng rezili bolup, u Nepsaniyetchilik, Sadaqetsizlik parnikida yétiship, ösup chiqqan bolidu. Satqin uyghurlarning qara köngli bu dewridiki barliq menpeettin menla behriman bolsam hetta bu Alemdiki barliq haram nersilermu manga nisip bolsa deydighan nepsaniyetchi, özining toymas nefsi üchün hemmini qilighan rezil Uyghurlardur. Insan Pidakarliq we Jenggiwarliq rohini teslimchilik we janbaqtiliq erwahigha tigishiwetse elwette u öz Millitige Ihanet ,qilghan bolidu, sipi özidin munapiq, hain bolidu. Bugun Hijrettiki uyghurlar arisida ötmushimizdiki Abduxaliq Uyghurdek Pidakar, Jenggiwarlar bolghididek, del Abduxaliq Uyghurni jallat Shing Shiseyge satqan rewendichi Rozi Mollidek Ihanetchi munapiqlarmu az emes. Abduxaliq Uyghurmu uyghur, Roza Mollimu uyghur shundaq turuqluq zadi nime üchün Roza Mollidek uyghurlar satqinliq qilidu? Bu yerdiki tup mesile ruhi jehettiki oxshimasliqta. Ikkisining otturisidiki ruh tuptin bir-birsiningkige oxshimaydu. Abduxaliq Uyghurda putkul Uyghur millitining azaliqi, hörligi üchün eziz jini pida qilidighan jenggiwar ruh bolghan, mana bu ruh Millitige wetenige bolghan muhebetti, Milletke wetenge bolghan chin dilidiki sadaqetmenliktin kelgen . Roza Molladiki bu zeyip satqinliq ruh bolsa, Qulluqqa chömgen, sexsiyetchi, nepsaniyetchi, Millitige bolghan sadaqetsizliktin kelgen. Emma ming epsusu 1933-yili 3-ayning 13-küni Abduhaliq Uyghur bolsa Jallat Shing Shisey teripidin wehshilerche qetle qilinghandin kiyin, munapiq hain Roza molla hich ish bolmighandek behrihaman yashawergen, uning aqiwetiti toghruluq hichqandaq tarixi matirlarda qilmishining jazasini yigen ispat yoq. Bu Alem Tarazisining bir üchida Milletning istiqpali üchün özini pida qilidighan Sadaqetmenler bolsa, yene bir üchida shexsi menpeet üchün hainliq qilidighan ihanetchiler bar. Biz tomlumimizning qarangghuliship kitishige yol qoymaslighimiz lazim. shunga qarangghu yerde waqirmay belki u yerge chiraq yiqishimiz lazim. U chiraqning Piligi choqum mustemkem bir milli ruhqa chilanghan bolushi lazim. Eskilikning yoli tuz hem qisqa bolidu, emma könglige ulughwar ghayilerni pükken yaxshi Insanlarning yoli egir-toqay hem uzun bolidu. Biz hijrettiki yashawatqan uyghur hemmiz könglimizge alem-shumul ghayilerni pükup, bu ulughwar yolgha chiqqan ikenmiz, „wetinim mini tonimisa men wetinimni tonuymen, Xelqim mini tonimisa men xelqimni tonuymen“ deydighan iradide bolushimiz lazim. Wetende yuz bergen tarixi tiradigiyelerni we kelguside yuz biridighan yaman aqiwetlerni közde tutup, bir-birimizge muhebbetlik qarap, inaq-itipaqliq bilen béshimizgha kelgen bu kulpetlerge taqabil turushimiz lazim. Zulmetlik bu teghdirimizge qarshi birlik bolsaq qutulimiz, birleshkensiri küchuyup mangimiz, kücheysek héch kim bizni izelmeydu. Waxti kelse ölmek nimiki bu Hayatta eng muhimi bishimizgha kelgenlerge héch unimizni chiqarmay qubul qilish , ghururimizning ayaq-asti bolushigha bash igish, öz wijdanini töt-besh tenggige sétish bolsa ölushtin beterdur. Shuning üchün ölumdin emes belki béshimizgha kelgen heqsizlikke, adeletsizlikke, teslimchilikke köz yumushtin qorqushimiz kirek. Wijdanimiz, Sadaqitimiz bilen bu dunyada shereplik yashishimiz lazim. Wijdan , Sadaqtet Allaning néhmiti, Milletning ghururidur. Insan arzu qilghan herqandaq nerse ichki amil bilen munasiwetlik bolup, sirtqi dunya peqet tashqi tesirdur. oy-pikrimiz dawamliq sadaqetmenlik bilen özimizni we millitimizni bextiyar qilidighan ishlarda bolushi hem bu pikirimizni tepekkur dunyarimizdin tashqi dunyagha yéyip, pütün küchimiz bilen tomlumning ichige singdurgende, biz yashighan bu Tomlum jennet makangha aylinidu. Birawlar Ter bilen gülletti bostan. Qaqaqlar bir Tuhum tukkan`gha Mékiyan. Miladi 1927 – yili (dawguangning yettinchi yili) ching leshkerliri tümen deryasining Qeshqer shehiri teripidiki qirghiqini xan béyjingdin ewetken zembirekler bilen üch kündin béri qattiq topqa tutmaqta idi. Bügün kéche tün yérimidin bashlap chiqqan boran, qum – topilarni uchritip kélip köz achquzmidi. Tang yorushi bilen ching leshkerliri deryadin nahayiti ongushluqla ötüp ketti. Ghojilar bu kéchidiki boranliq tün qarangghusini gheniymet bilip, öz eskerlirini élip aridin qachqanidi, deryaning bu qirghiqida peqet öy – makanlirini yawdin qoghdash üchün atlinip chiqqan xelq — suchilar, otunchilar, kasiplar, kichik élipsatarlar, Qeshqer medrisining yash talipliri, sheher etrapidiki yézilardin yighilghan déhqanlarla qépqalghanidi. Qolida tash – toqmaq, ara – gürjektin bashqa héchnéme bolmighan bu puqralar bilen toluq qorallan’ghan ching leshkerliri otturisida qattiq jeng bashlandi. Ching leshkerlirining qomandani qarshi qirghaqqa ötken leshkerlerning yéqilishigha qarap küchlük düshmen bilen élishiwatimen, dep oylap qaldi, u öz qoshunining hemmisini arqa – arqidin deryadin ötküzüp, bu jengge tashlidi, bir azdin kéyin bu qomandan meslihetchilirini egeshtürüp, nériraqtiki dönglükning üstige chiqip, uzun durbun bilen jeng meydanini közetkende, bashqiche ehwalni bayqap qaldi: minglighan atliq leshkerlerning otturisida qorshilip turghanlar — u oylighandek muntizim qorallan’ghan qoshun bolmastin, qollirigha tayaq – toqmaq tutqan addiy puqralar idi. Qomandan achchiq küldi – de, leshker bashliqlirigha, qarshiliq qilghanlirini rehim qilmay qirip tashlash, köplirini tirik esir élish buyruqini chüshürdi. Ah, tümen deryasi! Shu küni sende su emes, qipqizil qan aqti, shu küni sen kimlerning el üchün ölümge merdane barghanliqini; Kimlerning xelqni yirtquchlar changgiligha tashlap, xatirjemlik izdep, xa’inlarche qachqanliqini kördüng. Axirqi minutta tümen boyida qilghanlar — gepni chong qilghan ghojamlar, saxta niqabtiki her xil «zat»lar emes, addiy xelq boldi. Chin qehriman peqet heqiqiy jeng künila sinilidu. Tarixning ötmüshi, haziri, kelgüsimu ene shundaq bolidu. Ching leshkerliri chüshke yéqin Qeshqer shehiri ichige basturup kirdi, qariqi derwaza tereptin kötürülgen ot qizil tili bilen asmanni yalaytti. Leshkerler kochida uchrighan herqandaq janni atqa cheylitip, qilich bilen chépip tashlidi, pütün sheherni naresidilerning yigha – zari, sarasimige chüshken xalayiqning qalaymiqan qéchishliri, ghaljirlashqan leshkerlerning qiyqas – chuqanliri qaplidi. Mazarlarning heywetlik gümbezliri pachaqlinip, meschit – medrisilerning asman’gha sozulghan munarliri ghulap chüshti. Sheherning is – tütekke qaplan’ghan asminida, yüzligen kepterler özlirining ilgiriki tinch makanini izdep, sersan bolup egishetti… Qatar – qatar ketken restiler, baylarning soda – sarayliri talan – taraj qilindi. Bu dehshetlik bulang – talang we qirghinchiliq üch kün dawam qildi. Ching emeldarliri öz leshkerlirini Qeshqer shehiridiki meshhur chong baghlardin biri bolghan gülbaghqa orunlashturghanidi. Tötinchi küni etigende bu baghning heshemetlik chong derwazisi échilip, aldi bilen ikkidin sep tüzüshken 12 ret dumbaqchilar daqa – dumbaq chélip chiqishti. Ulardin 20 qedem arqisida ching xanidanliqining bayriqini kötürgen atliq leshkerler köründi, bayraqtin yene 20 qedemche nérida beshtin sep bolup tizilghan qoshun chiqip kelmekte idi. Bu ching emeldarlirining Qeshqer shehirining élin’ghanliqi sheripige ötküzülidighan «ghelibe namayishi»ning bashlinishi idi. Qoshunning aldi teripide béyjing xanliqi ewetken sériq kiyimlik atliq leshkerler mangghan bolup, eng aldidiki égiz toruq at üstide aq saqalliq qéri général kéletti. Uni leshkerler «beyxuza yang darén» déyishetti. Qeshqer qozghilingini basturush üchün ili jyangjüni teripidin ewetilgen leshkerler bolsa, addiy kök matadin kiyim kiygen bolup, xanliq leshkerlirining arqisida, ularning atliri tozutqan topa – changlargha kömülüp, piyade, tertipsiz sörilip kéletti. Éli leshkerlirining qomandani chin’go tümen boyidiki jengde jénidin ayrilghanidi. Qoshun derwaza aldida toxtap, ölgen bu leshker béshining qariliqi üchün toqquz pay po atqandin kéyin sheher ichige qarap méngip ketti. Ching qoshuni shu teriqide méngip, sheherning chong kochilirini aylinishqa bashlidi. Ahalining hemmisi öylirige békin’genidi. Bezide igisiz itlar kochini toghra késip ötüp qalatti. Yol üstiliride buzulghan imaretlerning yaghach – tashliri chéchilip yatatti. Yol yaqilirida sundurulghan ishikler, bulap quruqdap qoyulghan dukanlar, köyüp külge aylan’ghan restiler, tashlinip qalghan déhqan harwiliri, ölgen atlarning it yep yalingachlinip qalghan söngekliri közge chéliqatti. Yang darén at üstide xiyalgha pétip kétip baratti. Uzun chöl yollirini bésip kélip qilghan bu urush uni xop charchatqanidi. Yak darénning pütün ömri dégüdek chin xandanliqi üchün herqaysi jaylardiki «topilang» larni tinchitip bérish bilen ötti. Uning uzun saqalliri ene shu yürüshler jeryanida aqardi. U öz leshkerliri bilen jenubiy junggodiki bambukzarliqlarda boldi. Qanche yillap gensuning sériq topiliq édirlirida at chapturup yürdi. Nechche yil top – top qotazlar yaylaydighan tibet taghlirida temtirep yürdi. Bu yürüshlerde uning astidiki at qanche qétim yenggüshlendi, ejel qanche qétimlap uning tumshuqi aldigha kélip, yene qaytip ketti… Shu ishlarni oylisa yang darén özini bir – ikki esir ömür körgendek hés qilatti. U axirqi yillarda shuni chüshinip yettiki, puqraning xandanliqqa qarshi qozghilishlirini basturup tügetkili bolmaydiken, bu ghowghalar öchmes uchqundek héli bu yerde yansa, héli u yerde yalqunjaytti. Yang darén bu qétimqi jaza yürüshining axirqi yürüsh bolup qélishini xalaytti. U qérighan, harghan, zérikkenidi, uning bu qétimqi pilani — Qeshqer «topilang» chilirining bashliqini tirik tutup béyjinggha apirip, xandin chongraq in’am élip, ömrining axirqi künlirini paytexttiki heshemetlik baghlarda huzur – halawet bilen ötküzüsh idi. Epsuski, tümen boyidiki jengde u «topilang» chilar bashliqini qachurup qoydi. Yang darén ili leshkerlirining bashliqi chin’goning «eger bu sheherning sépili ichige kiriwalsam, ademlirining birini qoymay qirip tashlaymen! » dégen sözini eslidi, chin’go bu urushta tartqan ziyanlirigha chidimay, elemde shundaq dégenidi. Xanliqning «sheher élinsa leshkerlerning yérimi shu jayda qaldurulsun! » dégen buyruqi bar. Exmeq chin’go! Eger sheherdiki pütün adem qirip tashlansa, nechche minglighan leshkerlerni kim baqidu? … Chin’go özimu sheher sépili ichige qedem bésishqa ülgürelmidi. Tümen boyidiki jengde qawul tömürchi uni attin sörep chüshüp, choyun toqmaq bilen uning béshini yanjip tashlidi. Yang darén héytgah meydanigha yétip kélip attin chüshti. Bu yerde uni sheherning ulughliridin ikki kishi bashlirini sanggilitip, qol qoshturup kütüp turatti. Bularning ichidiki pakar boyluq, qara saqalliq kelgen kishi sidiq ghoja bolup, u bu qétim ching leshkerlirige yol bashlap kelgenidi. Égiz boyluq, aq yüzlük, qériraq kelgen ikkinchi kishi abduréshit damolla dep atilatti. U Qeshqer xelqi ichide yüksek abruygha ige bir zat bolup, baylar, ghojilar, mötiwerler öz jénini daldigha élip, her terepke pitirap kétishken shu künlerde, u xelq ichide qalghanidi. 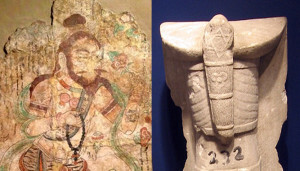 U kishini leshkerler buyruqqa bina’en tünügün kéchidin béri izdep, aran tépip kélishkenidi. Yang darén héytgah meschitining aldidiki égiz supigha chiqti, jamaning ichige isilghan yoghan qazanlarda puruqlap gösh qaynawatatti. Charsildap quruq otun köyüwatqan ochaqlarning aldida ashpezler aldirash idi, hawani pishqan gösh we daghlan’ghan may puriqi qaplighan bolup, bu yerde yang darén’gha alahide ziyapet teyyarlanmaqta idi. — Hoy, qéni héliqi ademlerni buyaqqa keltürünglar! Töwende turghan héliqi ikki kishi darénning aldigha keltürüldi, ular qorqunch bilen bir – birige qarap qoydi – de, darén turghan supining aldigha kélip, bu hökümdarning aghzidin qandaq dehshetlik gep chiqarkin, dep bashlirini égip, qulaqlirini ding tutup turushti. — Ikkinglardin qaysingning mertiwisi chong? – dep soridi yang darén. Sidiq ghoja abduréshit damollamni noqup aldigha chiqishqa sheret qildi, abduréshit damollam ünchiqmay aldigha bir qedem ilgirilep chiqti. — Sheher xelqige méning buyruqumni yetküz! Ular öyliridin chiqip, ish – oqetlirini qilishsun, kimiki buzuqlargha egiship, xan’gha qarshi turidiken, kallisi élinip, sheher derwazisigha ésilidu. — Xop! – dep bash lingshitti damollam. — Ulargha éyt! Ular her ayda özige chüshken alwan – séliqni toluq beja qilip, leshkerlerni baqidu. — Ulargha yene shunimu uqturup qoy! Bizning leshker bashliqlirimiz xotun, bala – chaqilirini yiraq yerlerde tashlap, silerning amanliqinglarni qoghdash üchün bu yerge yétip keldi, köpinchisi uzaq yillarghiche bu yerde bolidu. Ularning qaysibiri öylinishni xalisa, puqralar uninggha eng chirayliq qizlirini bersun. — Mundaq qilishqa bolmaydu, – dédi damollam tatirip. — Bolmaydu, dégendin kéyin bolmaydu, men mundaq buyruqni xelqqe yetküzelmeymen! — Bizning emeldarlirimiz silerdin qiz alsa zadi néme bolmaqchi? ! Abduréshit damollam qoynidin ötkür xenjerni sughuruwélip yang darén’gha atti. Darénning arqisidiki bir muhapizetchi uni tosup ülgürgenidi, xenjer héliqi leshkerning neq péshanisige sanjilip, uni arqigha örüwetti. Abduréshit damollam leshkerning qolidin uchup chüshken qilichni shap qilip aldi – de, özining qarnini yérip tashlidi. Bu ishlarning hemmisi köz yumup achquchilik ariliqta bolup ötti. Yang darén qorqqinidin arqigha birnechche qedem dajip ketti. Abduréshit damollam héytgah meschitining supilirini qan’gha boyap, shu yerdila jan üzdi. — Buning kallisini élip, sheher derwazisigha ésinglar! – dédi qomandan. Bir jallat qilichini yalingachlighiniche yügürüp kélip, damollamning béshini késiwaldi – de, sheher derwazisigha qarap yügürdi. Bayatin abduréshit damollamning yénida turghan sidiq ghoja emdi özining teqdirining qandaq bolushini bilelmey ghal – ghal titrep turatti. Yang darén uninggha köz tikishi bilenla u özini darénning ayighigha tashlidi. — Buyruqlirini men özüm yetküzey, permanni ijra qilmay, puqraning heddi yoq. — Hay! Mawuninggha bir jarchi bilen birnechche muhapizetchi qoshup béringlar. U sheherning hemme kochilirini qoymay aylinip, buyruqni yütküzsun! Sidiq ghoja yéning bir tindi – de, ömilep qoyup, yang darén’gha tezim qildi. Andin arqisigha birnechche leshkerni egeshtürüp, héytgah meydanidin terep – terepke qarap sozulup ketken kochilarning birige qarap chapti. Üstige qopal toqulghan kanap rexttin uzun jende kiygen, paxpayghan chachliri béshidiki yirtiq kulasidin chiqip, yelkilirige chüshüp turghan diwane süpet bir kishi birinchi bolup, öz öyining ögziside peyda boldi. Quyash pütün etrapqa illiq nur töküp turatti. Héliqi kishi közlirini quyashning ötkür nuridin qachurup bir’az qisti – de, ögzidiki ghemsiz uchup yürgen kepterlerge dan chachti. — Al janiwarlar! Yer yüzidiki ademlerning peylidin silermu ach qaldinglar. Jakarchining kochidin anglan’ghan bu awazi ögzidiki kishining xiyalini bölüwetti. 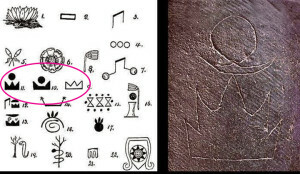 Su we ozuqluqqa muhtaj bezi namratlarning ishik échip chiqqinini hésabqa almighanda, köpinche öylerning ishiki téxi ichidin mehkem taqaqliq idi. Chachliri gejgisige yéyilip chüshken héliqi kishi öymmu öy yürüp ishiklerni qéqip warqiraytti: — i, qorqunchaq bendiler, ishikinglarni échinglar, manga nan béringlar, nan! . .
— Hesen derwish, mana sanga nan, bu yerge kelgine! Kichikkine derwaza üstidiki öyning dérizisi échilip, saqalliq bir kishining tatarghan chirayi peyda boldi. U kishi yuqirida turupla derwishning xaltisigha nan tashlidi. — Derwish, éytqina, leshkerler yene adem öltürüwatamdu? Sen némishqa qorqmay, kochigha chiqip warqirap yürisen? — chiwin qorighan yerge qonidu, ölüm qorqqan’gha yépishidu. Satirash usta, qorqmay öyüngdin chiqip dukiningni ach, xanning leshkerliri hemme ademni öltürüwetse, ularning qorsiqini kim baqidu? ! Derwish sapayisini sharaqlitip, yene ilgirilep ketti. Yoldin ötüp kétiwatqan atliq ikki leshker derwishning yénidin ötkende heyran bolushup toxtap qaldi. «U némidep warqirawatidu? – dep soridi biri yene biridin». — Men nedin biley u némilerning tilini. — Men uni chépip tashlaymen! Mest leshker qolini qilichqa uzatqanidi, yénidiki buradiri uni tosudi. — Qoy, u yene bizning yang darénning buyruqini yetküzüp yürgen adem bolup qalmisun. Yür, ittikrek bérip haraq tapayli. Derwish özige yéqinlap kélip, qaytip ketken ejeldin xewersiz, sapayisini chélip kétip baratti. U bulaqbéshigha chüshüp kétidighan tar kochilarning birige egigende, aldigha bir talip bala chiqti. — Hesen derwish, séni ustaz chaqiriwatidu. Bala derwishni keng bir hoyligha bashlap kirdi. Hoylining etrapini aylandurup sélin’ghan tüwrüklük péshaywanlar astida qatar ketken hujrilar bar idi. Bu — mehelle ichidiki kichik medrislerning biri bolup, ilgiri bu yer talip balilarning shawqunluq awazliri bilen tolghan bolatti. Hazir hoyla jimjitliqqa chöküp, ishikliri ochuq qalghan hujrilar ghéribsinip turatti. Bala bilen derwish hoylini otturisidin késip ötüp, kichik bir ishik arqiliq arqidiki baghqa chiqti. Tam yaqilirigha anar köchiti tikilgen bu güllük baghning ishiki yénidiki chong üjme derixi etrapigha qoyuq saye tashlap turatti. Üjme astidiki supa üstige körpe bilen yastuq tashlan’ghan bolup, körpide saqallirini aq arilighan bir kishi yastuqqa yölinip olturatti. — We’eleykum essalam, hesen, ebu qilghin, ornumdin turalmidim. Olturghan kishi ornidin sel qozghilip, derwishning olturushigha jay körsetti. Derwish xaltisi bilen qolidiki sapayini üjme yénigha qoyup, supining bir burjikige kélip olturdi. — Saqliqing yoqmu, qandaq? Közliring olturushup kétiptu yüsüp. — Qeshqer xelqining béshigha éghir kün chüshti. Mana, manga birqanche kündin béri uyqu yoq. Men séning awazingni bu yerde turup anglidim. Sen salamet ikensen. Hesen, méning qizimdin xewiring barmu? — Qizing nozuk bu jengde ayal emes, er boldi. Men uni tümen boyida at üstide kördüm, shundaq bir merdane perzent terbiyiliginingge apirin! — Tirik, epsus, u hazir düshmen qolida. Leshkerler tümen boyigha chiqqan minglap kishilerni qirip tashlidi. Alla ularning yatqan yérini jennette qilsun! Leshkerler yene nechche yüz kishini tirik tutup baghlap, hazir kona gülbaghda saqlap turuptu. Ularning ichidin yene qanchilirining kallisini késip, sheherning töt derwazisigha ésip qoydi. Paranglargha qarighanda, qalghanlirini ili terepke élip mangar imish. Yüsüp ustazning közliridin taramlap yash töküldi. — Könglühni buzma yüsüp, bu yalghuz Nozugumghila kelgen bala emes, bu éghir kün pütün Qeshqer xelqi üstige chüshti. Sen hörmetke layiq ata, öz naminggha munasip ustazsen, séning terbiyiligen perzenting, yétishtürgen shagirtliring elning béshigha apet kelgende, özlirining ada qilishigha tégishlik heqqini ada qildi. — Sen ularni qachan élip mangidighanliqini bilemsen? — Men sanga xewirini bérimen. — Hesen, men sanga könglümdiki gépimni éytip qalay, belkim, men ölüp kétermen. Qizim nozuktin ayrildim. Sen men béqip chong qilghan yétim oghul baqini bilisen. — Baqi chöl yollirida ching leshkerlirining béshigha apet sélip yürüptu. Xuda uninggha medet qilsun, yüsüp. —Nozugum bilen ikkisini bille oqutup, bille terbiyiligenidim. Balilarning her ikkilisi bir – birige amraq bolup öskenidi. Méning ularning béshini qoshup qoyush niyitim bar idi. — Alla séni yaxshi niyitingge yetküzsun! — Hesen, sen xudaning erkin bendisi. Séning qediming yetmeydighan yer yoq. Sen bu sözlirimni könglüngde saqlap qal. Qizim xelqqe, öz muhebbitige sadiq bolsun, sen uninggha éyt, qiz üchün öz nomusini, pakliqini saqlash hemmidin ela, mana bu xenjerni bir amal qilip Nozugumgha yetküzüp bérersen. Yüsüp ustaz yaltirap turghan qara sapliq xenjerni yastuq astidin élip derwish qoligha uzatti. — Xosh. Men bu xenjerni, qilghan amanet sözliringni bir amal qilip Nozugumgha yetküzimen. Sözliringning menisige chüshendim. Yaxshi ata öz perzentige yaxshi terbiye bilen yaxshi söz qalduridu. Qéni yüsüp, mangimu atighiningni ber, menm yolumgha mangay. — Sanga néme kérek hesen? — Manga nan ber, nan! — Xaltangda birnechche kün yetküdek nan turuptu. Bir kün yetküdek ozuqi turup tileshning durus emeslikini bilisen’ghu, hesen? — Men ghérip külbemge kochida qalghan yétim balilardin on nechchini yighdim. Ulargha nan toshup yürimen. Qéni aldingdiki nandin ikkilenmey birni manga sun’ghin, özümmu kün boyi aghzimgha héchnéme salmidim. Mangimu hayatliq kérek. Kim bilidu, menmu Nozugum bilen bille oweyis 1 «uweyis — chighatayning kéyinki xanliqliridin biri, uning maziri ilida, xelq uni «sultani oweyis maziri» dep ataydu. » mazarliri terepke bararmen. — Bizning arimizda yene bir kishi bar idi, hesen. — Toghra, men sanga hazir shuni esletmekchidim. Bizning arimizda yene bir kishi bar idi, u ghojamlar ewladidin bolghan sidiq ghoja idi, u mensep we bayliq tépish yolida jan köydürdi, kéyin u chong mensepdarmu boldi. Heddi – hésabsiz bayliqqa érishti. Emma uning bu ametlik künliri uzaqqa barmidi. Ghojilarning bu qétimqi talishishida u yéngilip qachti we nomussizliq bilen bizning üstimizge qanliq qilich tutqan leshkerlerni bashlap keldi. Yéqinda u yene put – qolliri baghlan’ghan qullar we bayliq artilghan tögilerni élip mangidighan leshkerlerge yol bashlap iligha bérip, u yerdin chong mensep élip qaytip kelmekchi, u yash waqtida biz bilen heqiqet, wijdan, hörlük heqqide qéziship talash – tartish qilidighanidighu? َ kördüngmu, kimiki haramdin bayliqqa ériship, nepsining yoligha kirip ketse, uningdiki heqiqet üchün bolidighan qizghinliq öchidu. Peyghember eleyhissalam «jennetning derwazisigha bérip qarisam, jennetke kirgenlerning köpchiliki kembegheller iken. Baylar bolsa, hésab bérish üchün uning derwazisi aldida tosulup qaptu» dégenidi. Bayliq we mensepke bolghan héris, insandiki hemme yaxshi xisletlerni yütüp ketküchi ejdihadur. Men sidiq ghojining péyige chüshimen, uni öltürmigüche qoymaymen. Belkim, bu yolda özümmu ölüp kétermen, ölüm men üchün xushalliq. Ademler pütün hayatiy boyi bextini izdeydu. Emma ölümning özi bext ikenlikini chüshenmey, bu qéchip qutulghili bolmaydighan heqiqettin exmeqlerche qachidu. Kishini jahanning ghem – ghussisidin, jahandarchiliqning hiyle – mikirsidin xalas qilidighan ölümning özi xatirjemlik, uning özi bext. Xeyr, körüshkiche aman bol, yüsüp! Tutqunlarni iligha élip mangidighan küni ching leshkerliri pütün sheher xelqini yarbagh derwazisi aldigha heydep chiqti. Ular xan’gha qarshi chiqquchilarning teqdiri qandaq bolidighanliqini körsitip, puqralarning yürikini qattiq bir mujimaqchidi. Derwaza aldidiki yéngidin ornitilghan égiz darda nechche onlighan adem bashliri pulanglap turatti. Leshkerler tümen boyidiki jengde tirik qolgha chüshkenler ichidin ishqa yaraydu, dep qarighanlirini talliwélip, qéri – chüri, balilarning hemmisini öltürüp bu yerge asqanidi. Derwaza aldigha yighilghan ademler ichide yektek kiygen aqsaqal bowaylar, közliri yashangghirighan momaylar, top ichide qistiliship yürgen yalingach balilar, qolliri qadaqlashqan kasiplar, aptapta qarayghan déhqanlar közge köprek chéliqatti. Ching emeldarliri sheher xelqige: «birmu jan qalmay yarbagh derwazisi aldigha chiqsun! » dep buyruq chüshürgen bolsimu, bu ademler ichide yashlar körünmeytti. Yéqinqi yillar ichide arqa – arqidin bolghan yéghiliqlar tüpeyli, yashlar ölüp tügigen, az qalghan bir qisim oghul – qizlarni xelq ching emeldarlirining közidin qachurup yoshurushqanidi. «Keldi! Keldi! » dégen awazlar bilen teng ademler topi tewrinip, sheher derwazisi ichidiki yolgha aqti. Yiraqtin qoyuq chang kötürülüp, atliq leshkerler chépip kelmekte idi. Ular yopurulup kéliwatqan ademler topini rehimsiz qamchilap, atqa dessitip, ikki terepke sürüp yol achatti. Arqidin qatarliship kéliwatqan töge karwini köründi. Bu tögilerge yolda lazimetlik nersilerdin bashqa, qimmet bahaliq herxil mallar – baylarning dukanliridin buluwélishqan top – top yipek rextler, hindi, iran sodigerlirining soda sarayliridin musadire qilin’ghan türlük boyaq, ipar we bashqa puraqliq dora – dermanlar, xan’gha sowgha qilin’ghan altun – kümüsh, gilem, ésil mis jabduqlar, merwayit we bashqa qimmet bahaliq tashlar qachilarn’ghan sanduqlar artilghanidi. Bu mallarni yüzlep leshker quruqdap kelmekte idi. Töge karwinining arqisidin bir – birige chétip baghlan’ghan nechche yüz tutqun sörilip kéletti. Bu sürgünlerning etrapini atliq leshkerler qorshighan bolup, ular qilichlirini yalingachlap, özlirige sürlük tüs bérishke tiriship gidiyip méngishatti. Sürgünler topi aldida palaqlap kéliwatqan pakar boyluq, saqalliq kelgen adem kaniyini kérip, ene shundaq warqirap kelmekte idi. Uning uzun perije chapini ayighigha yögiship, ittik méngishigha kashila qilatti. Arqidiki atliq leshker at üstidin éngiship, uni qamche bilen pat – pat noqup, chapsan méngishqa ündeytti. — Sidiq ghoja! — dep ghezepke keldi yol chétidiki kishiler arisida turghan hesen derwish we, – tüfi, munapiq! — dep yerge tükürdi. Derwish uyqusidin oyghan’ghandek bolup közlirini yoghan achti. Qeshqer xelqi özining süyümlük perzentini tonudi. Nozugumning üstidiki uzun etles könglekning renggi kün nurida önggen bolup, uning uzun, qara chachliri saghrisidin éship tashlinip turatti. Chéke chachlirining arisidin chiqqan qizil qan, sol péshanisini boylap éqip chüshüp, qapqara qashliri üstide uyup qalghanidi. Qiz etraptiki qérindashlirigha toymay qaraytti we uning közliri top ichidin kimlernidu izdeytti. — Jénim qizim, séni xudaning özige tapshurdum. Xuda séning jimi müshkülüngni asan qilsun! — Xeyr ilim – meripet, hüner – sen’et makani! Burutliri emdila xet tartishqa bashlighan bir yigit topiliq harwa yolida atliq kéliwatatti. Etrapidiki dalalarda chöl torghiyi churuqlishatti. Yiraqtiki toghraqliqlardin kakkuk awazi kéletti. Yoghan chaqliq yar – yar harwini heydep kétip barghan déhqan sozup naxsha éytatti. Uning naxshisi maysirighan chaqlarning ghichirlishi bilen qoshulup, achchiq bir peryadqa ochshiship kétetti. Atliq yigitning xiyali Qeshqerde uchup yüretti. Buningdin ikki yil ilgiri u shu yerdin yari bilen xoshliship chiqqanidi. Zilwa boyluq qiz shu chaghda, neqishlik derwazining qanitigha yölinip turup, yoghan shehla közliri bilen uni uzitip qalghanidi. — Men sizni tosmaymen. Choqum qaytip kéling! – dégenidi qiz. Yigit shundaq xiyallar bilen aqsu shehiri ichige yétip keldi. Sheher namratlar bilen tolup ketkenidi. Qol sunup turghan jul – jul kiyimlik tilemchiler qedemde bir uchraytti. Chong meschitning aldidiki seynada bir qéri meddah etrapigha adem yighalmay küchinip warqiraytti. Ademler kochilarning doqmushlirigha, chayxanilargha toplishiwalghan bolup, ching leshkerlirining Qeshqer shehiridiki qanliq qirghinchiliqi we bashqa wehimiler üstide qorqunchqa chüshüp parang qilishatti. Anglighuchilar üchün bu gepler jengnamilerdiki herqandaq riwayetlerdin qiziq we dehshetlik tuyulatti. Hemme jayni ensizchilik basqanidi. Yoghan sögetning sayiside chach éliwatqan «uzun qulaq» satirash etrapidikilerge Qeshqer shehiridin heydep kéliwatqan sürgünlerning bügün – etining ichide aqsu etrapidin ötidighanliqi heqqidiki eng yéngi xewerlerni sözlep, etrapigha oliship gep anglawatqanlarni heyrette qaldurup, huzurlanmaqta idi. Bazar restiliridiki ishikliri qara sirlan’ghan dukanlarda olturghan sodigerler teshwishke chüshüp, pokeyning arqisidin boyunlirini sozup, ötken – kechkenlerdin néme ish boluwatqanliqini sürüshtürüshetti. Yigit étini yétilep, ademler topini arilimaqta idi. U bu yerdin hesen derwishni izdep yüretti. U derwishning aqsugha kelgenlikidin xewer tapqanidi. Qeshqerdiki weqeler toghrisida eng ishenchlik xewerni peqet hesen derwishlar sözlep bérishi mumkin idi. Yigit béshigha kulah, üstige uzun chapan kiygen herqandaq ademning aldigha ötüp qaraytti. Ademler toplan’ghan barliq sorun, hemme chayxanilargha bir – birlep kirip ötetti. Atliq yigit aqsu shehiri ichini ene shundaq qédirip yürgende, hesen derwish sheher chétidiki xilwet bir chayxanigha kirip keldi. U chayxanichidin bir cheynek chay soridi. Chaychining özini diwane dep oylap qélishidin ensirep, dastixan’gha aldin birnechche yarmaq tashlidi. Chaychi chay keltürgendin kéyin, u qoynidin bir parche qattiq nan bilen bir siqim örük méghizini élip, petnusqa tökti – de, mustehkem chishliri bilen qattiq nanni kursulditip chaynap we her qétimda birnechche tal méghizni qoshup kap étip, ishtiha bilen ozuqlinishqa bashlidi. Yillar boyi otning aldida turup qaridap ketken puchuq cheynekning chéyi puraqliq hem lezzetlik idi. Issiq chay derwishning bedinini qizitip, harduqini alghandek boldi. Del shu chaghda, chayxana aldigha atliq bir kishi kélip toxtidi. — Hey, chaychi ustam! Bu yerge derwish süpet bir méhman kelgendek boldimu? — Qéni, attin chüsh inim. Shu tapta sen éytqandek bir kishi chay ichip olturuptu. Yigit étidin sekrep chüshüp, atni ériq boyidiki sögetke baghlidi – de, atqa bir az yem bérip qoyushini tapilap, chaychining qoligha pul tutquzdi. — Essalamu eleykum, hesen tagha! – yigit chayxanining qiysiyip ketken pakar ishikidin éngiship kirip, derwishning qélin chang basqan chapinining péshidin söydi. — Saliming xudagha qobul bolsun, oghlum baqi. Derwish, yigitning péshanisidin söyüp, uni ornidin turghuzdi. — Silining aqsugha kelgenliridin xewer tépip, xushal bolup, pütün sheherni izdep chiqtim. — Warang – churung köp jayda pikir chéchilidu. Bikarchi tola orunda pitne – pasat köp bolidu. Taghang xaliraq jayni izdep, bu yerge kélip qaldi. Qéni, nan’gha éghiz tegkin! Derwish bilen baqi chay ichkech paranglashti. Derwish Qeshqerde bolup ötken ishlarni qisqiche sözlep berdi. — Ching leshkerliri Nozugumni sürgünler bilen bille ekéliwatidu. Men ularni shékerköl 1 «shékerköl — maralbéshining üstidiki bir köl. » boyidiki yolda yandap ötüp kettim. Ularni atliq 500 leshker qoruqdap kelmekte, séning ishliring qandaq? – dep sözini axirlashturdi derwish. — Méning etrapimda on nechche kishi bar, hemmisi qorqumsiz yigitler. Biz bu etraptiki chöllerdin ötken herbir leshkerning jénigha xewp sélip yürüptimiz. Men Nozugumni ularning qolidin choqum ajritiwalimen, tagha! Bu yolda yaki men ölimen, yaki meqsitimge yétimen. Sili qeyerge qarap seper qildilikin, bilishke bolarmu? — Men silerni izdep tapmaqchidim, nishanemge yettim. Méning meqsitim — xa’in sidiq ghojini jazalash, uning xelq aldidiki jinayiti chékidin ashti, u yene bu qétim iligha mangghan leshkerlerge yol bashlap kétip baridu. U ili jyangjün mehkimisidin chong mensep élip qaytmaqchi, men uning iplas hayatini öz qolum bilen burunraq tamamlashni xalaymen. — Hebbelli! – baqi tügülgen mushtini dastixan üstige qoydi, – bu xa’in’gha jaza bérishni bizmu xéli burunla oyliship qoyghan. — Elwette, biz uni bu qétim aman qoymaymiz. — Xosh, undaqta séning aldingda ikki chong ish turuptu. Biri, ashiqingni yawning changgilidin qutuldurush ; Yene biri, xa’inning edibini bérish. Sen bu ikki chong ishning qaysisini aldi bilen orunlimaqchi? Derwish öskileng qashliri astidiki ötkür közlirini baqigha tikti. — Leshkerler aqsudin ötüp, aldimizdiki uzun chöl yollirigha chüshkende, xuda nésip qilsa, ademlirim bilen ulargha qaplandek tashlinip, hem xa’inni jazalaymen, hem Nozugumni qutulduruwalimen. Hah! Hah! Hah! … – derwish saqallirini titritip külüp ketti, – xuda yaxshi niyitingge yetküzsun oghlum. Sen téxi yenila bala. On nechche adem bilen 500 kishilik chong qoshun’gha chéqilish — tuxumni tashqa urghan bilen barawer. Bilip qoy, yaxshi yol bashchi öz ademlirini xeterge bashlimaydu! Baqi ornidin chachrap turup, derwishning qolini tutti. — Tagha, oghulliri téxi gödek, éytsila, siliche qandaq qilghinimiz tüzük? Derwish öz pilanini baqigha sözlidi. Ularning söhbiti shu teriqide yene yérim sa’etche dawamlashqandin kéyin, ular chaychi bilen xoshliship yolgha chiqti. — Qéni oghlum, sen étinggha min, men piyade mangimen, xeyr, xuda salamet qilsa, sürgünlerdin bir kün ilgiri siler turghan yerge yétip barimen. Baqi étigha ménip yolgha chüshti. Derwish arqisidin uning qarisi yitküche qarap qaldi. Köklem uzap ketti, qish pesli yetti. «He, dunyagha kélip, ketmeydighan néme bar? » derwish achchiq bir küldi – de, sapayisini chélip yolgha chüshti. Qaza ilkige bermishmen inanu ixtiyarimni. Ching leshkerliri sürgünlerni qanchilik qamchilimisun, yol yenila awumidi. Kündüzliri chöl qattiq issip, qumluqta ayagh yötkep méngish azab bolatti. Mangalmay sörilip qalghanlarni leshkerler rehimsiz halda chépip tashlishatti. Bezide ölgen at we tögilerning yüklirinimu sürgünlerge artip qoyushatti. Chöl yolida arghamchidek sozulup kéliwatqan ademler üstide quzghunlar egip uchushatti. At – tögilerdin chiqiwatqan issiq tiniq, ademlerning bedinidin kötürülüwatqan achchiq ter puriqi, bularning hemmisi qoshulup kishining könglini aynitqudek sésiqchiliq peyda qilatti. Peqet köydürüp turghan quyash olturushqa bashlighandin kéyinla salqin chöl shamili peyda bolup, ademler qénip nepes éliship, yénikliship qalghandek bolatti. Yerlik hökümetlerge «Qeshqer topilingi»ni bisiqturup qaytqan leshkerlerni yaxshi kütüwélish toghrisida yarliq chüshürülgenidi. Sürgünler bilen olja mallarni ekéliwatqan bu chong — qoshun chong – kichik bazarlargha yéqinlashqanda, yerlik emeldarlar ularning aldigha chiqatti, herbir öteng we qonalghularda kéliwatqanlar üchün aldin qazan ésilip turatti. Aldi bilen ching leshkerliri ghizalinip, andin ashqan – tashqan nersiler sürgünlerge üleshtürülüp bériletti. Bügün ular aldidiki ötengge yétip baralmay, chöldila toxtap qondi. Leshkerler emeldarlar üchün aldirap – ténep birqanche kigiz öy tikishti. Tügiler ochuq daligha da’ire qilip chöktürülüp, sürgünler kéchisi qéchip ketmisun üchün putidin zenjirler bilen bir – birige chétip baghlinip, tögilerning otturisigha orunlashturuldi. Etrapta leshkerler gülxan yéqip yétishti. Shu tapta, nériraqtiki chong gülxanning etrapigha birmunche leshkerler olishiwalghan bolup, otturida olturghan qériraq leshker néme toghrisididur qiziship hékaye qilip bériwatatti. — He, shundaq qilip umu yiqildimu? – dep so’al qoyup aldiratti sözligüchini bir leshker. — Pah, üchinchi adimimizmu qilich yep yiqildi. Biz birqanchimiz héliqi topilangchini qistap kelduq. Yéqinlap bérip qarisam, wah, téxi aghzidin anisining süti ketmigen bir shumtek iken. Men arqisidin kélip del uning boynigha qaritip qilich urdum, pah, qandaq boldi, bilmidim, qilich uning béshigha sel – pel tégipla ötüp ketti. Uning chökürüp kiyiwalghan tumiqi béshidin uchup ketti – de, uzun chéchi chuwulup arqigha chüshti. Bashta men «hoy, bu bizning törilirimizdin birerimu, qandaq? ! » dep chöchüp kettim. Obdan sepsalsam, aldimda turghini bir qiz iken. Men «wah» dewettim. Yénimda turghan birnechcheylenmu tengla «wah» dewétishti. Uning chéchigha qarap téngirqap qalghan leshkerlerning biri shu zamanla qilich yep yiqildi. Shu esnada, u étini déwitip, bizning qorshawimizni yérip chiqip ketmekchi bolghanidi, biz uninggha biraqla yopurulup bérip baghliwalduq. Pah, tazimu yaman némiken, men shu yéshimgha kélip, mundaq soqushqan ayalni körmigenidim. — Némishqa uni shu yerdila chépip tashlimidinglar? — Chépip tashlimaqchiduq, lékin leshker bashliqi uni körüp «pah, némidégen güzel néme bu! Uni iligha apirip, jyangjünning özigila sowgha qilip, in’am alimiz» dep qaldi. Suqushta ayallarning chirayi öz jénigha zamin bolghanliqini körgenidim. Bu qétim u özining güzelliki bilen aman qaldi. — Yol boyi naxsha éytip kéliwatqan héliqi qiz shumu? Nozugum yol boyi qéchish xiyalini özidin néri qilalmidi. Lékin, leshkerlerning nazariti nahayiti qattiq idi. Nozugum pütün mungini naxsha qilip éytip keldi, u leshkerler tillisimu, ursimu éytiwerdi. Axir leshkerlermu urup – tillap zérikip, uning meylige qoyup berdi. Nozugum xiyal bilen uyaq – buyaqqa örülüp uxliyalmidi. Chöl asminida sansiz yultuzlar jimirlaytti. Etraptin tögilerning pushuldashliri, atlarning ot yéyishliri, sürgünlerning ulugh — kichik tin’ghan awazliri anglinatti. Pat – pat, panus kötürgen qoruqchilar uyaq – buyaqqa ötüp qalatti. Tütep köyüwatqan gülxanlardin chöl ösümlükliri yiltizining puraqliq isi kélip dimaghqa urulatti. Kigiz öylerdin mest bolup qalghan leshker bashliqlirining warqirashliri anglinatti. «hey, shuning bilen méning yashliqim tügigenmidu? Iligha barghanda ajiz béshimgha néme künler chüsher? … » Nozugum shundaq hesretlik xiyallar bilen uyqugha ketti. U chüshide atisini kördi. Ata anarliq baghdiki supida olturup Nozugumni chaqiratti. Nozugum bu awazdin oyghinip ketti. — Nozugum qizim, bu sizmu? Uni rasttinla biri chaqiriwatqandek qilatti. U ong yénigha örülüp, qéshida yükünüp olturghan saqalliq kishini körüp chöchüp ketti. — Nozugum, qorqma qizim! Bu men — hesen derwish. Hesen derwish qizning yénigha qiysaydi – de, uning aghzini aliqini bilen tosudi. — Tagha, bu chüshümmu, ongummu? Sili bu yerge qandaq kélip qaldila? — Chüshüng emes, ongung qizim. Chöl shamalliri manga silerning puriqinglarni yetküzdi. Qizim, manga egiship qéchip chiqip kételemsen? — Tagha, bizning putlirimiz bir – birimizge chétip kishenlen’gen. Hesen derwish Nozugumning ayighini silidi. Mustehkem tömür zenjir uning qoligha uruldi. — xeyriyet! – dédi derwish, – gheyretlik bol, xuda sanga azadliq nésip qilghuche boshashma. Men bu terepke mangghanda atang sanga salam éytti. Séni pak bolsun, xelqige, muhebbitige sadiq bolsun, dédi. Bu atangning sanga ewetken sowghisi. Nozugum derwishning qolidin éghir polat xenjerni aldi – de, yoshurdi. — Qizim, éytqina, sidiq ghoja qeyerde? ! — Sidiq ghoja? ! – Nozugum seskinip ketti, – u yüzsiz héchkimning chirayigha tik turup qariyalmaydu. Leshkerlermu uni arigha almaydu. U aldi terepte körünüp turghan kigiz öylerning eng chétidikide yalghuz turidu. — Xeyr qizim, aman bol! 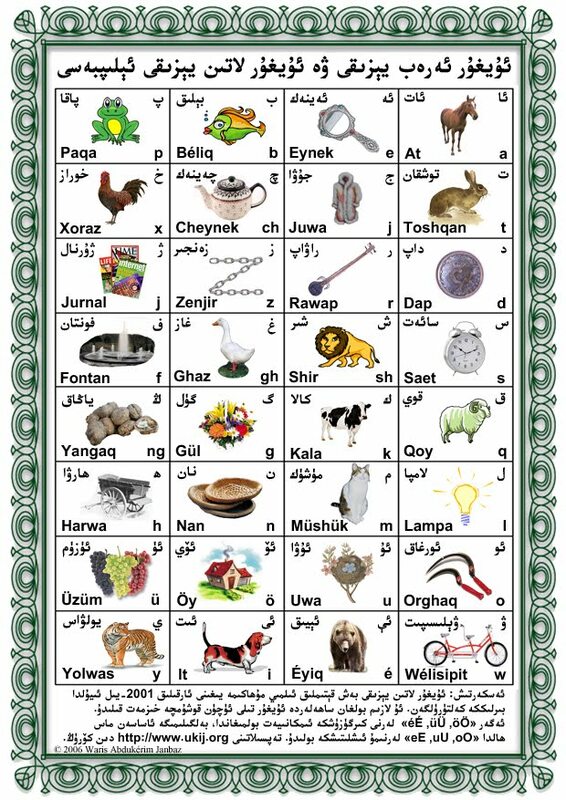 Derwish qandaq téz peyda bolghan bolsa, qarangghuluq ichide yene shundaq téz ghayib boldi. Nozugum uningdin atisi, baqi we yene némiler toghrisida köp nersilerni sorimaqchidi, emma ülgürelmidi. Nozugumgha buning hemmisi bir tiniq ichide bolup ötken chüshtek bilindi. Lékin, bu chüsh emes idi. Uning qolida atisining ötkür xenjiri yaltirap turatti. Ata düshminini özüngge dost tutma. Égiz qum döwilirining arqisida turghan bu xarabe gümbez yiraqtin qarighan kishilerning közige chéliqmaytti. Qachandur bir chaghlarda bu yer heshemetlik xaniqa, meschit we tünekxanilar bilen awat idi. Mazargüy ashiqlar üchün yoghan dash qazanlar toxtimay qaynap turatti. Hazir etraptiki hemme nerse qum astida qalghan bolup, qaysibir ewliyagha atap sélin’ghan mushu égiz gümbezla choqchiyip chiqip qalghanidi. Gümbezning ichi – sirtigha aq gej bilen suwap chékilgen güller öchken, uning egme qilip yasalghan torusliridiki ajayip neqishler xireleshkenidi. Gümbezning sherqqe qarighan kichik ishikining yaghachliri her terepke qiyshiyip turatti. Baqining ademliri sidiq ghojini mana mushu gümbez aldigha ekélip tashlighanidi. Qoli arqisigha baghlan’ghan sidiq ghoja yükünüp olturup, aldidiki kishilerge yalwurmaqta idi. Chirayliri aptapta qarayghan on nechche yigit uni ötkür közliri bilen közitip turatti. — Tur ornungdin! – dep warqiridi baqi, — séning hayating özüngning bir qoshuq qénini tileshtin néri barmidi. Shu bir qoshuq qéning üchün talay bigunahlarning qénini sel qilip aqquzdung. — Xuda azmas, biz xudaning azghuchi bendilirimiz, men azdim, méni kechürünglar. — Séni u dunyagha barghanda allaning özi kechürsun, bizde sanga rehim qilish hoquqi yoq, xelq séni alliburunla ölümge höküm qilghan. Biz hökümni ijra qilghuchilarmiz. Sidiq ghoja «way – dad» sélip, chölni béshigha kiydi. Gümbez ishikige yölinip turghan hesen derwish shu tapta chongqur xiyaligha chökkenidi. Uning köz aldidin tümen boyida tökülgen qanlar, qiriliwatqan xelqning ahu zari, Qeshqer shehiri derwazilirigha ésilghan bashlar, ching leshkerlirining qanliq qamchisi astida sörilip kéliwatqan sürgünler ötmekte idi. Sidiq ghojining yalwurup biljirlashliri derwishning jehlini qozghidi. Qiziq qan uning tomurlirigha tépip, qulaqliri wingildap ketti. U yénida turghan yigitning ghilipidin ötkür qilichni sughuruwaldi – de, gürsüldep dessep otturigha keldi. — Qéni yigitler, uning qolini yéshiwétinglar. U qandaqla bolmisun, bir musulmanning balisi, ölüsh aldidin taharet éliwalsun. Yigitlerdin biri kélip, sidiq ghojining qolini yéshiwetti, yene bir yigit uning aldigha bir qapaq su keltürdi. Lékin sidiq ghoja qoli boshishi bilenla héchnémige qarimay hesen derwishning aldigha étilip bérip, uning putini quchaqlidi. — Hesen, séning adem öltürüshke qandaq qolung baridu. Xudadin qorqmamsen!? — Allaning mubarek namini hemme teng éghizgha alidu, lékin kimning xudadin heqiqiy qorqup pak yashighanliqi peqet mehsher künila ayrilidu. Séni öltürüsh gunah bolsa, meyli, alla bu gunahni méning zimmemge yazsun! — Éytqina, méning néme jinayitim bar? Xelqqe yamanliq qilish niyitim yoq idi. Leshkerler méni qilich astigha élip zorlidi. — Abduréshit damollammu sanga oxshash zorlan’ghanidi. U düshmenning ayighida ömileshtin ölümni ela bildi. — Shundaq, men qorqunchaq, men jinayitimni yuyimen. — Iplas! Séning pütün hayating jinayet bilen tinip ketken. Sen uni öz qéning bilen yumighuche yuyup tügitelmeysen. Bir kün oshuq ömür körseng zimmengdiki jinayet bir ülüsh ashidu. Men séning hayatingni öz qolum bilen tamamlash üchün séni chöl boyi qoghlap keldim, qop ornungdin! Taharet élip, iman éytiwal. Ölüsh waqtida bolsimu ademdek öl! Sidiq ghoja qum üstige özini tashlap, hörkirep yighlashqa bashlidi. U yoghan közlirini her terepke tashlap, jénimni qutuldurup qalidighan bashqa birer nerse yoqmidu? ! dep alaq – jalaq qaraytti. Awazining bariche peryad salatti. Kitabxan, choshqini öltürseng chirqirap jan béridu, heywetlik qarighayni kesseng, u ünchiqmay örülidu… Taqet qilalmighan derwish sidiq ghojini yerdin yuluwélip, qilich bilen bir urupla kallisini üzüp tashlidi, shuning bilen peryad awazi öchüp, goya gürkirep chiqiwatqan boran birdinla tinchip qalghandek etrapni éghir jimjitliq basti. Xa’inning késilgen béshi gümbez ishiki yénigha qangqip chüshüp, qomgha düm bolup pétip qalghanidi. Derwish qolidiki qilichni yerge tashlidi. Éytishlargha qarighanda, kéyin bu yerdin ötken yoluchilar bu xarabe gümbezning yénida peyda bolup qalghan yéngi bir qebrini körgen. Qebre yénigha qoyulghan tashqa éniq qilip, «kimiki bu yerdin ötse, xa’in’gha lenet oqughay» dégen sözler oyulghaniken. Shu ishtin kéyin, sürgünlerni qutuldurup qélish üchün ularning qarisini yittürmey egiship kéliwatqan baqining yigitliri tün qarangghusidin paydilinip, ching leshkerlirige birnechche qétim hujum qildi. Emma, leshkerler san jehettin nahayiti üstün idi. Yigitler her qétimda on nechche düshmenni yer chishlitip, chékinip ghayip bolushqa mejbur bolatti. Chöl qaplanlirining hujumidin aramsizlan’ghan leshker bashliqliri axir kéngiship, yüzdin oshuq leshkerni «qaraqchilar»ni qoghlap yoqitishqa ajratti. Qalghan leshkerler sürgünlerning méngishini ittiklitish üchün yol üstidiki mehellilerdin déhqanlarning ésheklirini bulap kélip, herbir éshekke ikkidin tutqunni — erni aldigha qaritip, ayalni arqigha qaritip olturghuzup baghlap, ularni jédellep heydidi… Bara – bara hawa salqinliship, taqir tagh, qumluqlar axirliship, payansiz otlaqlar, qarighayliq taghlar uchrashqa bashlidi. Sürgünler ili wadisigha yéqinlashmaqta idi. «Qaraqchilar»ni qoghlashqa ajritilghan leshkerler baqining yigitliri bilen kichik bir tagh ichide doqurushup qaldi. Jallatlarning qiqas chuqini, tömür qorallarning bir – birige tégip jaranglishidin tagh qushliri ürküp hawagha kötürüldi. Bu qattiq jengde baqi éghir yaridar boldi. Könglige bir hiylini pükken hesen derwish yigitlerni chékinishke buyrudi. Chöl yigitliri özlirini qoghlap kéliwatqan ching leshkerlirini bir körünüp, bir körünmey toptoghra üch kün egeshtürüp yürdi – de, andin ghayib bolushti. Ching leshkerliri özlirining aldan’ghanliqini chüshen’gende, teklimakanning barsa kelmes qumluqlirigha alliburun ichkirilep bolghanidi. Bu yerde ne su, ne giyah, ne hayatliqtin eser yoq idi. Kündüzliri qiziq quyash bash üstidin néri ketmey, méngilerni qaynitiwétetti. Kéchiliri dehshetlik boran kötürülüp, at – ulagh, ademlerni qumgha kömetti. Yigitler ching leshkerlirini epchillik bilen ene shundaq tirikla dozaxqa tashlidi. Bu yerdin birmu leshker yol tépip qaytip chiqalmidi. Bir mezgil bu chöl asminini quzghunlar qaplidi. Uzun yillarghiche bu yerdin ötken yoluchilargha qilich, qalqanlar, qaghjirap ap’aq yaghachqa oxshiship qalghan ustixanlar uchrap turdi. Zalim dowang (dowang — ching xandanliqining eyni yillardiki padishahi dawguang) zar yighlatti. Iligha heydep kélin’gen sürgünler ghulja shehiri yénidiki sherqi yamulgha qamalghanidi. On kün ötkendin kéyin barliq gundixanilarning ishiki échilip, sürgünler yamul ichidiki keng bir meydan’gha élip chiqildi. Bu yer her qétim alte sheher din keltürülgen tutqunlarni satidighan resmiy bazar bolup qalghanidi. Bügün bu yerde ilining keng, munbet yer – süyini bölüshüwalghan zémindarlar, uzun chachliq töriler, bashlirigha égiz moza kiyip, qollirigha yelpügüch tutup, tawar chapanlirining peshlirini kötürüwalghan emeldarlar ighangship yüretti. Ularning beziliri üchün déhqan, beziliri üchün malchi, bezilirige kömür qazghuchi, bezisige öy chakiri we bezilirige bolsa chirayliq qizlar lazim idi. Sürgünler chiqishi bilen héliqi adem bédikliri her tereptin kélip olashti. Ular sürgünlerning ichini arilap, xuddi mal bazirida mal körgendek qarashturushqa bashlidi. Beziliri almaqchi bolghan adimini uyaq – buyaqqa örüp. Buljung göshlirini tutup körüp baqatti. Özlirining sétiliwatqanliqini körüp turghan sürgünler bu chidighusiz xorluqni ichige yutup, adem qélipidin chiqqan wehshiylerge ot chaqnap turghan közliri bilen lenet yaghduratti. Sodisi pütken baylar alghan ademlirining pulini tölep, chette turghan chaparmenlirining yardimi bilen ularni xuddi qassaplar mal baziridin mallarni heydep chiqip kétiwatqandek söreshtürüp élip méngishqa bashlidi. Ilidiki chong emeldarlarning biri bolghan shisen daloyi xotunperes adem idi. U Qeshqerdin chirayliq qizlar keltürülüptu, dégen xewerni anglap, bu yerge özining mal alghuchisini ewetkenidi. Shisen daloyi ewetken adem — ju famililik pakar, sémiz néme bolup, bashqilar uni «ju pangza» deytti, ju pangza sürgünler ichidiki ayallargha bir – birlep qarap chiqqandin kéyin, Nozugumning aldigha kélip toxtap qaldi – de, «pah, adem balisimu mundaq qamlashqan bolidiken – he! » dewetti. Béshigha kelgen éghir künler we uzun yol azabi Nozugumning chirayini sarghaytqan bolsimu, uning pütün siyaqidin yenila yashliq we güzellik urghup turatti. Nozugumning qoyuq qara chachliri chigishlinip, könglekliri yirtilghanidi, u nazuk qolliri bilen köksining ochuq qalghan qismini ju pangzining hayasiz tikilgen közliridin dalda qildi. — Hi! … Hi! … Hi! … — ju pangza hijayghiniche, sürgünlerni sétish ishini bashquruwatqan emeldarning yénigha ighanglap keldi, – bizning daloyigha ashu qizchaqni alsaq bolarmikin bahasi qanchidu? — Boldi, boldi, puli qanche? — Daloyidin köp sorimaymiz, tapan heqqimiz üchün mana mushunchilikla birnerse bersengla bolidu. Emeldar qol isharisi bilen Nozugumning bahasini oqturdi. — Wah, bu bek öre bolup ketti. Bunchilik pulgha shundaq chentudin beshni sétiwalghili bolmamdu? ! — Özliri mal tonuydighan adem, körüp turupla, bu chentu qizi mushu mallarning aldi. Bahasigha chiqsa satimiz. Bolmisa, jyangjünning özigila sunsaqmu xéli in’amgha ige bolalaymiz. — Boldi, gepni uzartmayli, munchilik altun – kümüsh tölisek qandaq? Emeldar jupangza éytqan bahagha könmidi. U uzun qollirini jupangzining burnighiche sunup, Nozugumning xususiyetlirini sanap körsetti. — Birinchidin, özi güzel, ikkinchidin, ishqa chéwer, üchinchidin, qamlashturup naxsha éytalaydu. — Hi… Hi… Hi! Boptu, undaq bolsa, mana munchilik sap altun töley, – dep bahani yene örletkinini isharet qildi. Uzaq talishishtin kéyin, emeldar bilen ju pangza Nozugumning bahasini pütüshti. Parqirap turghan tillalar emeldarning aliqinigha tökülüshi bilenla ikki chaparmen kélip, Nozugumni söreshtürüp élip mangdi. Nozugumning aylap bille bolghan japakesh seperdashliridin ayrilishqa közi qiymaytti. Sürgünler yashqa tolghan közliri bilen uni uzatmaqta idi. — Xeyr, salamet bolung Nozugum! — Jahan zalimlarningla bolup ketmes? ! — Xeyr, aman bolsaq yene körüshermiz! Qandaq bir jan ajritar? ! — Hoy, hoy! – dep silkishtürdi Nozugumni ekitip barghan chaparmenler, – némanchila kakiraysen? Aldirima téxi, daloyining öyige barghanda naxshini taza éytiwalisen. Shisen daloyining ayal xizmetkarliri Nozugumni yuyundurup, uninggha bir qur yéngi kiyim kiydürgendin kéyin, ju pangza özining bu qétim qilghan sodisigha bekmu memnun boldi. Nozugumning topa – chang ichide qalghan chirayi pakizlinip, uning hösnige hösn qétilghanidi. Nozugumni daloyigha körsitish üchün daloyining yasidaq hoylisining otturisi bilen élip mangghanda uning chong – kichik xotunliri öz hujrilirining ishikliridin béshini chiqirip, heset bilen qarashti. Nozugumni ekirgende shisen daloyi öyning töridiki kangda, qara tawar körpe üstide yanpashlap yétip epyün chékiwatatti. Shisen daloyi göshlük, keng yüzini chéchek izi qaplighan choqur idi. Ömri keng jungghar dalalirida zorawanliq qilip, qan kéchish bilen ötken bu zalimni kishiler arqisidin shisen maza 1 «shisen maza — shisen choqur. » dep atishatti. U éghir gewdisini teslikte qimirlitip, qiysiq közliri bilen Nozugumgha sinchilap qaridi. Nozugumning uzun, qara chéchi ghunche boyi bilen boyliship turatti. Uning qulaqlirining aldi – keyni we nazuk boyunlirida balilarningkidek meyin tükler éniq körünüp turatti. Qizning chirayi xunuk aq chiraylardin bolmay, yéqimliq, qaraqumchaq chiraylardin idi, uning pütün siyaqi nurlinip turghan qizil yaqutqa oxshishatti. — He, yaraydu, bu taza men oylighinimdin iken, – dep ornidin turup ketti shisen maza. Ju pangza yorghilighiniche daloyining aldigha kélip, sürgünlerni satqan emeldardin angliwalghan geplerni tekrarlap, Nozugumning xususiyetlirini sanashqa bashlidi. — Hi… Hi… Hi! Mundaq chentu qizi kem tépilidu, anisi silidek ghojamlar üchünla tughqan – de, bu qétim kelgen qizlarning ichide aldi mushu iken, shunga bahasimu örirek boldi. — Boldi, boldi. Kérek yoq! — Shundaq, mal yaxshi, özi güzel, ishqa chéwer, yene nahayiti naxshichi iken, men uni naxsha éytquzup körüp aldim. — Naxshichi? ! Ha… Ha… Ha! Qéni, uninggha éyit, uning naxshisini men bir anglap baqay. Ju pangza shisen mazining telipini Nozugumgha terjime qilip berdi. Nozugum héchqandaq tartiship turmayla naxshisini bashliwetti. — Ha! Ha! Ha… U némidep naxsha éytti? — U burun bundaq heshimetlik öylerni körmigenlikini, mundaq chirayliq kiyimlerni kiymigenlikini qoshaq qilip éytti. Silini maxtidi, – dédi ju pangza. — He, yaxshi. Uning awazimu saz iken, manga zérikkende naxsha éytip bersun, uninggha éyt, u yol yürüp hardi. Bir – ikki kün obdan dem alsun, andin men uning üchün chong toy ötküzüp bérimen. U buningdinmu puzur öylerde turidu, téximu ésil kiyimlerni kiyidu. Shisen maza xizmetkarini chaqirdi – de, tapan heqqi üchün ju pangzigha bir top güllük tawar bérishke buyrudi. Shisen maza Nozugumni körüp heqiqeten xushal bolghanidi. U uzundin béri mushundaq bir chirayliq, yash xotun’gha érishishni oylap yüretti. Emdi u bu güzel qizni yénida élip yürüp bashqa emeldarlarning közidin ot chiqiriwétishni oylighanda, xushalliqi chékige yetti. U Nozugumni resmiy toy qilip élish qararigha keldi. Alman – talman teyyarliq qilip, üchinchi küni toy bashliwetti. Toygha yiraq – yéqindiki chong emeldarlarning hemmisi dégüdek chaqirildi. Ili jyangjüni özi kélelmigen bolsimu jyangjün mehkimisidin alahide sowghatlarni ewetip, shisen daloyining toyini qutluqlaydighanliqini bildürdi. Shisen maza «yigit» üchün teyyarlan’ghan xas hujrigha tün yérimidin ashqanda kirip keldi. Bu chaghda u dégüdek mest bolup, öre dessep turalmaytti. Nozugum öyning töridiki chimildiq ichide, atisi hesen derwish arqiliq ewetken xenjerning sépini mehkem tutqiniche, mingbir xiyallar bilen olturatti. U atisi éytqan «pakliqini saqlash, muhebbitige sadiq bolush» dégen wesiyetlerning ehdisidin chiqarlarmu? ! Shisen maza ishik échip kirishi bilen Nozugumning yüriki ixtiyarsiz qattiq sélip ketti. Xizmetchiler shisen mazining sirtqi kiyimlirini saldurup qoyghandin kéyin bir – birlep chiqip kétishti. Shisen maza hijayghiniche chimildiq terepke qarap mangdi. — Hi… Hi… Hi! 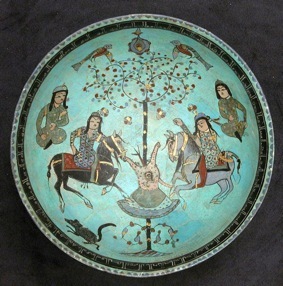 Qiz, sen tartinma, — shisen maza chimildiqni qayridi, – qiz, sen yéqin kel. Yüriking némanche düpüldeydu? Qorquwatamsen? Nozugum shisen mazining öyidin qéchip chiqip, tün qarangghusida özining qayaqqa qarap kétip barghanliqini bilelmey méngiwerdi. Üstidiki éghir toyluq kiyimler uning ittik méngishigha kashila qilip, her qedemde u némilergidu putlishatti. Bara – bara öyler shalangliship, Nozugum bir uchuqchiliqqa chiqip qaldi. Éhtimal, bu etrap térilghu yer bolsa kérek, yiraqlardin itlarning ensiz hawshighan awazliri kéletti. Nozugum toxtap, üstidiki qan yuqi toy kiyimlirini sélip tashlidi – de, qolidiki bopisini yéship, özining kona kiyimlirini kiydi. Qeyerlerdindur bulbul awazi kéletti, aldi tereptin salqin shamal urulatti. Kün chiqish terep biliner – bilinmes aqirip, yéngi bir tangdin belge bermekte idi. Nozugum seherning sap hawasini sümürüp, chongqur bir nepes aldi – de, gheyretlinip yene méngip ketti. U erkinlik manga rastinla qaytip kelgenmidu? ! dep hayajanlinatti. Nozugum uchup emes, yenila méngip kétip baratti. U shiwaqliq keng bozni késip ötken yalghuz ayagh yol bilen töwenlep chüshüp, tuyuqsiz derya boyidin chiqip qaldi. Bu chaghda etrap yorup ketkenidi. Nozugum qirghaqlirighiche su bilen tolup éqiwatqan deryagha qarap heyran boldi. Öz ömride u mundaq mol suluq éqinni körmigenidi. Derya otturisidiki chatqallardin bir top su qushliri palaqship kötürüldi – de, közdin ghayib boldi. Nériraqtiki qirghaqta ap’aq saqalliq bir boway sugha tashlan’ghan qarmaq yiplirigha qarighiniche, xiyalgha chöküp olturatti. U arqidin kéliwatqan ayagh tiwishini anglap béshini kötürdi. Nozugummu aldida tuyuqsiz peyda bolup qalghan bu ademni körüp, chöchüp toxtidi. — We’eleykum essalam, qizim, bu qaq seherde sen qeyerdin peyda bolup qalding? Chiraying bir qisma körünidu. Béshinggha kün chüshüp, özüngni deryagha tashlashqa chiqqan oxshimamsen? Boway uzun yillardin béri bu qirghaqlarda béliqchiliq qilatti. Derd – elemge chidimay özini deryagha étiwalidighanlar uninggha köp uchrap turatti. Bezide uning tashlighan torigha béliq emes, derdmenlerning jesiti élinip chiqatti. Shunga, u bügün seherde asmandin chüshkendekla peyda bolup qalghan bu qizni choqum, özini deryagha tashlighili kelgen oxshaydu, dep oylap qaldi. — Qoy qizim, peylingdin yan, özini öltürüwalghanlarni allamu yaxshi körmeydu. Özünggü sewri ber. Nozugum néme déyishini bilmey yerge qarap turatti. — Némishqa ünchiqmaysen? Qandaq ishlar séni bu yerge sörep chiqti. Manga sözlep bergine? — Tetey! Kirip ajritip qoymisingiz, daloyi yash xotun’gha chapliship qalmisun yene, ha! Ha! Ha! … – dep ochuq zangliq qilishti. — Ohush, bu qéri yüzini daptek qilip, némanche chiqalmaydu? ! dédi – de, bérip ishikni qaqti. Ichidin héchqandaq shepe bolmighandin kéyin, u achchiq bilen ishikni bir ittirgenidi, ishik échilip ketti. Lin tetey milengzini qayrip öyge kiripla dehshetlik chirqiriwetti. Shisen maza chimildiqning yénida qanda chiliship yatatti. Bu xewer jyangjün mehkimisidikilerni patiparaq qiliwetti. Shisen daloyining emeldarliq derijisini hésabqa alghanda uning ölümini béyjingdiki xanliq mehkimisige melum qilish lazim idi. Éli jyangjünni Nozugumni tirik tutup kélish üchün töt etrapqa chérik chiqardi. Nozugumni izdep chiqqan chériklerning bir qismi derya boyigha yétip kelgende, béliqchi boway Nozugumni kona qolwiqi bilen alliqachan yolgha séliwetkenidi. Bowaydin Nozugumni sorap, uchurini alalmighan chérikler uning yikenler bilen yépilghan kepisini ongtey – tongtey qiliwétip ötüp kétishti. Nozugum tün qarangghusidin paydilinip qomushluqtin salamet qutulup chiqip, yene töwen’ge yol saldi. U dolqunlargha urulup toluq bir kéche aqti. Yene bir yéngi tang atti. Nozugum qoghlap kéliwatqan chériklerning arqida qalghanliqigha köz yetküzgendin kéyin, qolwaqni qirghaqqa tartti. Derya boyidin bashlan’ghan yantuluq yuqirilap bérip yiraqtiki qarighayliq taghqa ulishatti. Qarighayliq tagh choqqiliri köküch reng alghan bolup, tolimu chirayliq körünetti. Nozugum qirghaqqa chiqip yüz – közini yudi. U eplik bir jayni tépip, azraq su qaynitip ichip, isinishni izdeytti. Nozugum qolwaqtin béliqchi boway bergen mis kora bilen birnechche parche qattiq nanni aldi – de, korigha su élip, yuqirilap méngip ketti. Nozugum qarighayliq tagh ichige kirip, özige panahliq jay izdidi. Qélin qarighayliq ichi téxi qarangghuliship turatti. Dimaghqa chirigen, nemxush tupraqning hidi urulatti. Qurup yiqilip, bir – birige chirmiship ketken qedimki yaghachlar yolni tosup turatti. Tinch yatqan say – jiralar, sirghip éqiwatqan tagh suliri kishige tolimu sirliq sézimlerni béghishlaytti. Nozugum yoghan bir qoram tashning arqisida qariyip körünüp turghan töshükni kördi. U siliq tashlar üstidin awaylap dessep ötüp, héliqi kamar ichige kirdi. 1 «shungqar téghining hazirqi sowét ittipaqi chégrisi ichide bir ghar bolup, uni hazirmu kishiler «Nozugum» ghari deydiken. » bu ichi xélila keng qarangghu ghar idi. Her halda, kündüzliri adem közidin, kéchiliri boran – chapqundin dalda bolghudek yer taptim, dep xoshal boldi Nozugum. Tagh ichini axturup yürgen chérikler qarighayliq ichidin kötürülüwatqan isni körgende, bu yerde birer malchining qara öyi bolsa kérek, dep oylap, gösh, qimiz teme qilip, atlirining bashlirini is chiqiwatqan terepke buridi. Nozugum at tuyaqlirining tashlargha urulghan awazidin endikip oyghinip közini achqanda, yigirmige yéqin atliq chérik uning aldigha yétip chiqip bolghanidi. Nozugum birinchi bolup kelgen chérikke qaynawatqan mis korini élip atti – de, toshqandek bir irghipla gharning ichige kirip ketti. Chérikler warqiriship, arqa – arqidin attin chüshti. Bu gharning aghzi tar idi. Nozugum ghar ichige kirip, uning kirish éghizi yénida tashqa chapliship turuwalghanidi. Uning qolida yene qara sapliq «ata xenjiri» parqirap turatti. Éngiship kirgen birinchi düshmen neq gholidin xenjer yédi, chérikning qolidin uchup chüshken qilich tashqa urulup jaranglap ketti. Nozugum chérikning bedinige chongqur patqan xenjerni sughuruwélishqa ülgürmidi. Bu sémiz chérik özining éghir gewdisi bilen xenjerni bille élip yiqildi we özining dermansiz qollirini sunup, Nozugumning putigha ésildi, Nozugum qarangghuluq ichidin yerge chüshken qilichni siypashturup derhal tapti – de, arqigha örülüp, chérikning köngleklirining étikige yépishqan qollirini bir urup üzüp tashlidi. Ölgen chérikning ikki puti téxi gharning sirtida turatti. Qalghan chérikler uni putidin tartip sirtqa chiqiriwaldi. Bu chérikning bir qoli bilen béshining yérim qismi ghar ichide üzülüp qalghanidi. Dümbiside sépighiche pétip ketken xenjer turatti. Bu dehshetlik haletni körüp, héchkim ghar ichige qedem bésishqa jür’et qilalmidi. Chérikler bashliqi chériklerge warqirisa, chérikler bir – birini alidigha ittiretti. Chérikler bashliqi qanche zorlapmu öz ademlirini gharning éghizigha apiralmidi. Ichi qapqarangghu bolup turghan bu ghar hemmining közige ejel éghizi bolup körünetti. Shu tapta, gharning ichige kirish emes, uning aldidin yügürüp ötüp béqish üchünmu chong qehrimanliq kérek idi. Nozugumning qorshiwélin’ghanliqi toghrisidiki xewer jyangjün mehkimisige yétip kélishi bilen jyangjün yene ikki yüzche chérikni taghqa chiqishqa buyrudi. Chüshke yéqin tagh ichini atliq chériklerning warang – churungi, atlarning kishneshliri qaplidi. Ürkügen tagh qushliri égiz örlep, bu tinch makanda peyda bolup qalghan yéngi «méhman» lar üstide heyran bolup egishetti. Nozugumni tirik tutush jéngige qomandanliq qilidighan herbiy emeldar attin chüshüp, héliqi dehshetlik ghargha yiraqtin éngiship qarap, weziyetni közetti. — Uning qolida qandaq qoral bar? – dep soridi herbiy emeldar. — Düshmenning xenjiri olja élindi. Qurban bolghan adimimizning qilichi gharning ichide qaldi, – dep jawab berdi chérik bashliqi. — Hoy eqilsizler, bu kichikkine töshüktin bir – birlep kirishidighan bolsang, u hemmingni qirip tashlimaydu? ! Önggürning aghzini buzunglar! Chérikler lom tömürlerni tépip kéliship, gharning aghzini buzushqa bashlidi. Birer sa’et hepileshkendin kéyin, ghar aghzi öydek échildi. Ghar ichini yorutush üchün chérikler qarighay shaxlirini qarimaygha chilap, mesh’ellerni yéqishti. Herbiy emeldar mesh’el tutqan chériklerni aldigha, qalghanlarni arqigha tizip, ghar ichidiki «düshmen» ge qarshi qiqas – chuqan bilen heywetlik hujum bashliwetti. Bu yerde xuddi erebler yawrupagha yürüsh qilghandek, chinggizxanning ademliri seddichin sépilidin ötkendek heywetlik körünüsh shekillendi. Bir ajiz qizgha qarshi ikki yüzdin oshuq qoralliq esker sep tüzüp hujumgha ötidighan mundaq «ajayip» urush tarixtimu kem uchrisa kérek. Herhalda ular «ghelibe» qildi. Chérikler ghar ichidin Nozugumni baghlap élip chiqqanda, yene bir qanche chérikning ölükimu bille chiqti. Nozugum ghar ichide herbir egilishlerde yoshurunup turup, ularni bir – birlep yiqitqanidi. Bu manjular zulumi anga nédur bak. Shéhit aliy muqami özre yetsun. Nozugum kürediki gherbiy yamulgha qamalghanidi. Xanning Nozugum toghrisidiki buyruqi 40 nechche künde aran yétip kélelidi. Xanliq möhür bésilghan bu hökümnamige «bu xet kéchide yétip barsa, kündüzge qaldurulmay öltürülsun ; Kündüzi yétip barsa kéchige qoymay öltürülsun! » dep yézilghanidi. Jyangjün mehkimisi Nozugumni ghulja shehiri yénidiki moytungzida öltürüp, kallisini sheherge ésip, xelqqe ibret qilishni jakarlidi. Moytungza sheherning sherqi teripidiki döng üstide idi. Bu küni moytungzigha baridighan chong yolda ademler sel bolup aqti. Ularning ichide ömrining tengdin tolisini kusida mükchiyip olturup ötküzgen mozduzlar, sheherning satirashliri, tömürchiler, qolliri sarghiyip ketken könchiler, etraptiki sehralardin kirgen aq malixayliq déhqanlar we bashqa hemme kesiptiki ademler tépilatti. Ademler jimjitliqqa chöküp, egiship mangatti. Naxshining herbir sözi, naxsha éytiwatqan qizning herbir tiniqi ularning qelbige éqip kiriwatqandek tuyulatti, hemme bu ippetlik qizning teqdirige échinishatti. Uning qehrimanliqigha apirin oqushatti. Döng üstidiki keng meydan’gha yétip kelgende, chérikler düpdügilek da’ire bolup kishilerni tosudi. Nozugumni bu da’ire otturisigha ekirip, harwidin chüshürdi, jallat bashliqi uni tizlinip olturushqa buyrughanda, qiz yüzini qiblige qaritip olturdi. Pütün meydan chongqur sükütke chökti. Shu tapta hemmining yürikini ghezep örteytti. Herkim bu yükünüp olturghan qizni qutuldurup qélishni izdeytti. Herkim öz ichide: «bu xorluq we zulumning chéki barmu? » dep mushtumini tügetti. Lékin, herbir wijdan igisidiki bu ghezep uchqunlirini birleshtürüp, güldürlep yan’ghan yalqun’gha aylanduridighan yol bashchi téxi bu meydanda yoq idi. Bir jallat Nozugumning aldigha ötüp, qilichini shartilditip bileshke bashlidi, pütün meydanni ölüm wehimisi basti. Lékin, bu ölümning Nozugum üchün héchqanche dehshiti yoq idi. U toyluq chimildiq ichide shisen mazini pare – pare qilip tashlighan chéghidila özini bu ölümge atap qoyghanidi. Shu minutlarda u men ata wesiyitini orundiyalidimmu – yoq? Dégenni oylaytti. Özining pakliqi, zorawan küchlerge bash egmiginini oylighinida, u dunyada herqandaq qérindishimgha yoruq yüzüm bilen qariyalaymen, dep huzurlinatti. Nozugum ap’aq bulutlar bilen bézelgen köpkök asman’gha qarap külümsiridi. Shu chaghda, arqidin jallat bashliqining özi kélip, qizgha tuyuqsiz qilich urdi. Nozugumning béshi meydan’gha üzülüp chüshüp, uning uzun chachliri tupraq üstige yéyildi. Jallat bashliqi qan témip turghan qilichni yalap, ghilipigha saldi – de, ighanglap bérip, qizning késilgen béshini élip xaltigha tashlidi. Qéri sazende muqam éytmaqta idi. Satarning tariliridin chiqiwatqan nale muqamchining miskin awazi bilen qoshulup, anglighuchining yürikini titritetti. Kishining köz aldigha muradigha yételmigen ashiqning, baliliri ach – yalingach qalghan yoqsulning, judunluq künlerde kech qalghan yoluchining échinishliq hali kélip, köz yash töküwatqan anining peryadi anglan’ghandek bolatti. Közliri yumulghan muqamchining herbir tiniqida mingbir hesret ipadilinip, muqamning sözliri kishilerni chidamliq, sewrlik bolushqa ündeytti, éghir külpetlerge taqet qilishqa chaqiratti. Anglighuchilarni ghéribliq bésip, ularning bashliri barghanséri töwen chüshmekte idi. Muqam toxtishi bilen hesen derwish ornidin des turdi – de, sorunni yérip ötüp, muqamchining aldigha bérip, uning qolidin satarni aldi. — Bu nerse bügün’giche bizge peqet tesellila bérip keldi, birer qétimmu küreshke chaqirip baqmidi! Derwish shundaq dédi – de, qolidiki satarni sépidin tutup, yénidiki térek kötikige bir urup péqish – péqish qiliwetti. — Xalayiq! – dep ornidin turdi baqi, – biz Nozugumni qutuldurup qélish üchün uzun yollarni bésip kelgeniduq, kéchikiptuq, emma qisas kéchikmeydu. Biz bilen bille intiqam élishqa baralaydighanlar yürünglar! Ademler dürride ornidin turup talagha qarap mangdi. Qéri sazende xuddi uyqudin oyghan’ghandek bolup, közlirini yoghan achqiniche, ularning arqisidin qarap qaldi. Yigitler chayxana aldigha chiqip atlinishti – de, Nozugumni öltürüsh wezipisini orundap, kürege qaytqan jallatlarning arqisidin shiddet bilen at saldi. Kürege qaytqan chérikler bayanday sépiligha yétip kélip, qel’e ichide méhman boldi. Ular haraq – sharabqa yéterlik toyghandin kéyin, jyangjün’ge hökümning ijra bolghanliq xewirini bügündin qaldurmay yetküzüsh üchün, yene kéchilep yolgha chiqti. Mest chérikler at üstide ighanglap kétip bérishatti. Qaysibirliri mügdeytti. Jallat bashliqining keypi chagh bolup, qandaqtur bir ahanggha ghingship kétip baratti. Ular bayanday bilen küre otturisidiki bu chighliq dala yolining neq otturisigha yétip kelgende, baqemning yoshurunup turghan yigitlirining hujumigha uchridi. Bu ish shunchilik tuyuqsiz yüz berdiki, chérikler néme ish bolghanliqini chüshinip, özlirini ongshap bolghuche tamamen qirilip boldi… Birqanche minutqa barmighan bu opur – topurchiliq jimip, igisiz qalghan atlar her terepke pitirap ketkende, baqem étidin chüshüp, chériklerning ölükini arilidi. Ay nuri herterepke qiysayghan chiraylarni, béshi qatliship yiqilghan atning saghrisini, téxi ghilipidin chiqishqa ülgürmigen qilichlarning neqishlik destilirini éniq yorutup turatti. Baqem jallat bashliqining jesitini izdep tapti – de, qilich bilen uning kallisini késiwélip atqa ghanjughilidi. Baqemning ademliri shu yerdin qaytqiniche kéchilep toptoghra sheherge kirip, sheher yénidiki döngge ornitilghan dargha ésip qoyulghan Nozugumning béshini chüshürüwélip, uning ornigha jallat bashliqining béshini ésip qoyup ötüp kétishti. Tang yorughanda, baqem öz yigitliri bilen qarighayliq tagh baghridiki keng bir chimenlikke kélip toxtidi. Ular Nozugumning mubarek béshini dala gülliri bilen qaplan’ghan mushu ochuqchiliqqa depne qilmaqchi bolushti. Baqem öz yarining béshidiki qan daghlirini köz yéshi bilen yuyup tazilighanidi. Qizning chirayi yenila norlinip, qapqara közliri külüp turatti. Ular qehrimanning béshini kömüp, qebre yénigha yoghan bir tashni belge qilip qoyushti. Qebre yénida turghan hesen derwishning közliri yiraqqa béqip qisilghan bolup, uning yaki xiyal sürüwatqanliqini, yaki yighlawatqanliqini bilip bolmaytti. — Bu qizimning hayati pütün bir dastan. Xelqimiz öz qehrimanini ewladtin – ewladqa untumaydu, – dédi derwish axir jimjitliqni buzup. — Xeyr, sadaqetlik yarim! – dédi baqem we qilichini sughuruwélip, yénidiki tagh térikining égilip chüshken chong bir shéxini bir chépip, shirttide üzüwetti – de, étigha irghip mindi. — Xush, hesen tagha! Emdi qayaqqa tartimiz? — Qolimizdiki qilichni mehkem tutayli. «kimiki qilichning destisini tutushqa jür’et qilalmisa, u uning ötkür tighigha duch kélidu». 1 «w. G. Yan: «chinggizxan» atlarning béshini tagh terepke buranglar, bu taghlar ichide ching xandanliqining zulumigha qarshi ezimetler gülxan yéqip turuptu, biz ularni tapayli. 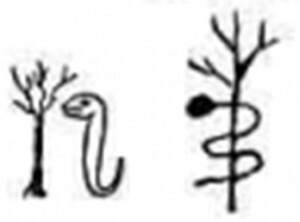 Bu téxi qisas élishning bashlinishi, – dédi derwish. Éhtimal, kitabxanlar hesen derwish bilen baqining kéyinki hayatining qandaq bolghinigha qiziqsa kérek, ularning herbirining hayati bir kitab bolidu. Lékin, men bu yerde qisqichila sözlep ötey. Hesen derwish uzun tayiqini qoligha tutup, seper xaltisini mürisige artip, kishiler arisini arilap, ularni qozghilishqa, zalimlar textini gumran qilishqa chaqirip, yene birqanche yillardin kéyin alemdin ötti. Baqem bu ajayip ademni Nozugum qebrisige yandashturup depne qildi. Aridin yene 30 yilche ötti. Ulugh teyping tyen’go inqilabining tesiri bilen ilida ching xandanliqining zulumigha qarshi büyük qozghilang partlidi. Kishilerning ichige tinip ketken derd – elimi ghezep – nepretke aylinip, biraqla étilip chiqti. Déhqan arisini, yaghachchi paltisini, tömürchi bazghinini — herkim qoligha chiqqan qoralni élip meydan’gha yügürdi… Shu künlerde, kishiler béshigha yirtiq kula, uchisigha konirap ketken uzun jende kiyge bir kishining at üstide baturlarche jeng qilip yürgenlikini körüshti. Xuddi wapat bolghan hesen derwish bu ulugh ishlardin tesirlinip, yene ademler arisigha qaytip kelgendek idi. 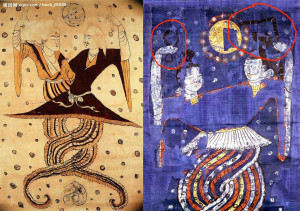 Qoyuq qara saqalliq bu qorqumsiz kishi, eng xeterlik jaylargha özini uratti, düshmen leshkerlirini rehimsiz qilichlaytti. Bu ademning buningdin 30 yil ilgiriki yash baqem ikenliki héchkimningmu ésige kelmeytti. Baqem bu jeng künliride, hesen derwishning tewerrük kiyimlirini kiyip, atlinip chiqqanidi. — Buni tut yigit. Qehrimanning qilichi bilen düshmenni adaqqiche sür! Kishiler bu jesetni hörmet bilen qoldin – qolgha élip kötürüshüp kétishti. Bu shéhitni yerlikke qoyidighan chaghda uning qoynidin bir parche xet chiqti. Xetke: «mubada men ölüp ketsem, jesitimni shimaliy tagh étikidiki bir jüp qebre yénigha qoyunglar» dep wesiyet qilin’ghanidi. Kitabxan! Siz mendin: Ularning qebrisi hazirmu barmu? dep sorarsiz. Yillarning shamalliri bu qebrilerning topisini uchurtup ketti. U yerde hazir rengmureng tagh gülliri échilip turuptu. Emma, u üch kishi téxi hayat, qehriman tupraqqa kömülmeydu, xelqning qelbide yashaydu!